Michael McCall, President and CEO of the Inner Arbor Trust, speaks at the dedication of the Chrysalis, April 22, 2017. (Click for a higher-resolution version.) Image © 2017 Frank Hecker; available under the terms of the Creative Commons Attribution 4.0 International License. tl;dr: The “Creating the Chrysalis” series ends with a timeline of significant events in the history of the Chrysalis, Merriweather Park at Symphony Woods, and the surrounding downtown Columbia area, from 1962 to the present, with references. 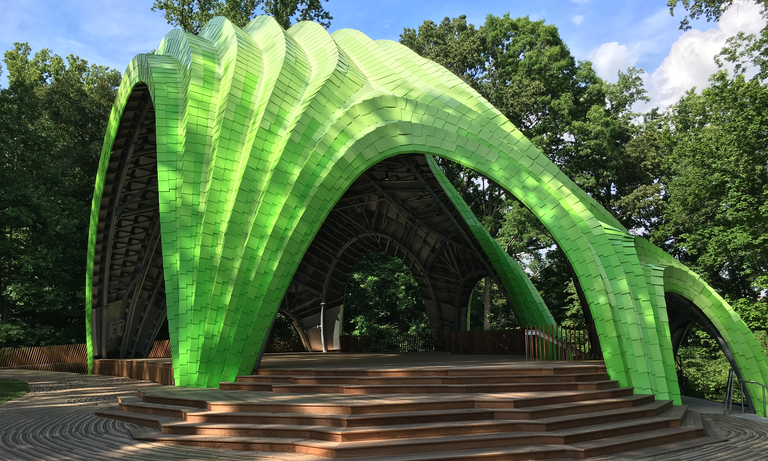 This article is the last in a series exploring in depth the creation of the Chrysalis amphitheater in Merriweather Park at Symphony Woods in Columbia, Maryland. For the complete list of articles please see the introduction to the series. Previous articles in this series discussed in detail various aspects of Symphony Woods, the Inner Arbor plan, the Chrysalis, and Merriweather Park at Symphony Woods. This article provides a timeline of events concerning these and related topics, including in particular downtown Columbia development and the evolution of Merriweather Post Pavilion, from the creation of Columbia to the present. It includes references for all events discussed in the timeline, and a final section listing additional sources of online information concerning the topics of this article. Jim Rouse begins the process of creating Columbia. April: Jim Rouse begins investigating acquiring land in Howard County, Maryland. Gunts, Edward. “50 years ago, a city was started behind scenes.” Baltimore Sun, Howard ed., 19 Feb. 2012, p. 1G. October 15: Jim Rouse proposes to Connecticut General Life Insurance a venture to “plan and develop … a New City of approximately 100,000 people” between Baltimore and Washington. Rouse, James W. Letter to Irving G. Bjork. 15 Oct. 1962, issuu.com/columbiaarchives/docs/1962-10-15-letter. Accessed 6 May 2017. Howard County learns of Rouse’s plans. October 29: Jim Rouse announces to Howard County officials and residents his intent to build a planned community on almost 14,000 acres of land recently acquired by Howard Research and Development, a joint venture between his company and Connecticut General Life Insurance. Pickett, Edward G. “14,000 acres in Howard to be developed.” Baltimore Sun, 30 Oct. 1963, p. 44. The idea of Symphony Woods first appears in print. November 11: Howard Research and Development publishes a marketing brochure for Columbia. Among other things, the brochure promises the establishment of a park on a 40-acre tract of wooded land in Columbia Town Center. Community Research and Development, Inc. Columbia: A New Town for Howard County. 11 Nov. 1964, p. 28, issuu.com/columbiaarchives/docs/columbia_a_new_town. Accessed 6 May 2017. June: The Rouse Company retains contractors to do clearing and grading in and around the future Village of Wilde Lake, including grading the lake bed and building access roads for construction equipment. “Clearing to start in Columbia.” Baltimore Sun, 19 June 1966, p. 7F. Columbia, Merriweather Post Pavilion, and Symphony Woods are opened to the world. June 21: Columbia officially opens with the dedication of Wilde Lake, followed by an opening to the general public five days later. Lewis, Jack. “Columbia opening slated.” Baltimore Sun, 18 June 1967, p. 2F. “New village—familiar name.” Hartford Courant [Hartford CT], 23 June 1967, p. 19. Hill, Frederic B. “Wet throng hails Columbia, Rouse, Humphrey, and music.” Baltimore Sun, 15 July 1967, p. 20B. Hume, Paul. “Merriweather Post Pavilion opens to critical acclaim.” Washington Post, 16 July 1967, p. D1. Arney, June. “Makeover for Merriweather.” Baltimore Sun, 26 May 2008, p. 1B. Merriweather Post Pavilion focuses on classical music. Merriweather Post Pavilion hosts performances by the National Symphony Orchestra and other artists, including Van Cliburn, Benny Goodman, and the New York City Ballet. “Season preview at the Post Pavilion.” Baltimore Sun, 19 May 1968, p. 14D. As the National Symphony Orchestra experiences labor difficulties and financial problems, popular music begins its takeover of Merriweather Post Pavilion. Spring-summer: Merriweather Post Pavilion begins to host rock acts, including Led Zeppelin, Blood Sweat and Tears, Richie Havens, Janis Joplin, and Iron Butterfly. Cowan, Richard. “With a little help…” Washington Post, 25 May 1969, p. B8. “Summer adventure in performing arts.” Columbia Flier, 18 June 1969, p. 1. October-November: The National Symphony Orchestra endures a six-week strike by musicians. Ross, Nancy L. “Musicians call halt to strike.” Washington Post, Nov. 24 1969, p. A1. The popularity of Merriweather Post Pavilion with rock acts leads to expansion and crowd control issues. Merriweather Post Pavilion expands its capacity by 2,000 by adding loge seating under canvas tents to the sides of the main pavilion and putting more seats in the aisles of the main pavilion. “New addition to Columbia.” Baltimore Sun, 12 May 1970, p. B6. June 27: After uncertainty over its financial situation, the National Symphony announces that it will have a full summer season at Merriweather Post Pavilion after all. Kriegsman, Alan M. “Symphony saviors.” Washington Post, 27 June 1970, p. C1. June 28. Several hundred people enter Symphony Woods and break through fences to gate-crash a concert by Procol Harum at Merriweather Post Pavilion. Concerts the next two days by The Who and others draw up to 20,000 people with no further problems. Hodge, Paul. “Crowd crashes Post Pavilion.” Washington Post, 29 June 1970, p. 4A. Ross, Nancy L. “Rocking on.” Washington Post, 1 July 1970, p. B5. The Rouse Company outsources management of Merriweather Post Pavilion, as Wolf Trap opens and competes with the pavilion for classical music performances. January: The Rouse Company engages Nederlander Arts Associates to operate Merriweather Post Pavilion under a 10-year lease agreement. “New managers at Merriweather.” Baltimore Sun, 24 Jan. 1971, p. D15. June: The National Symphony Orchestra schedules four summer performances at Merriweather Post Pavilion. “National Symphony plans Post Pavilion concerts.” Baltimore Sun, 20 June 1971, p. B4. July: After testing a prototype elsewhere in Columbia, Antioch College proposes to construct a 30,000 square-foot inflatable structure on Rouse Company land next to Symphony Woods and Merriweather Post Pavilion to house the college’s Human Ecology Center. “The ‘Bubble’.” Columbia Flier, 21 July 1971, p. 40. Clark, Michael J. “Big air-bubble campus planned.” Baltimore Sun, 2 Dec. 1971, p. C20. Clark, Michael J. “Antioch lays the cornerstone to pneumatic campus in Columbia.” Baltimore Sun, 7 July 1972, p. A9. July 1: Filene Center at Wolf Trap Farm Park in Northern Virginia opens with a concert featuring the National Symphony Orchestra. Sanders, Donald. “Park for the arts puts music in the Vienna (Va.) woods.” Baltimore Sun, 27 June 1971, p. D1. The Rouse Company and the Columbia Association try to attract more visitors to downtown Columbia, as the bubble bursts on another downtown scheme. Clark, Michael J. “Howard zoo’s 1st born a mule.” Baltimore Sun, 11 Sept. 1973, p. C13. October-December: Amid concerns about practicality, maintenance cost, and vandalism, Antioch College tries to sell its inflatable structure next to Symphony Woods, but “Mother Nature and larcenous scavengers” prove to be its downfall, as winds collapse the structure and thieves pick over the remains. Clark, Michael J. “College has bubble trouble.” Baltimore Sun, 26 Oct. 1973, p. A10. Clark, Michael J. “Scavengers plunder Antioch’s burst bubble.” Baltimore Sun, 6 Dec. 1973, p. C7. The Rouse Company attempts to steer Merriweather Post Pavilion away from rock and back to more traditional fare. January 29: The Baltimore Symphony Orchestra announces a series of performances at Merriweather Post Pavilion supported by funding from the Rouse Company, as Rouse executive Michael Spear notes the pavilion’s need to “change its image”. Galkin, Elliott W. “Symphony season adds Columbia.” Baltimore Sun, Jan. 30 1974, p. B6. Clark, Michael J. “Merriweather drums out rock era.” Baltimore Sun, 30 Jan. 1974, p. C11. April: Nederlander Arts Associates suspends operations at Merriweather Post Pavilion for the 1974 summer season, citing restrictions on rock acts and the Rouse Company’s unwillingness to expand seating. “Columbia concerts reduced.” Baltimore Sun, 26 Apr. 1974, p. C4. The Rouse Company continues its efforts to avoid having Merriweather Post Pavilion become a rock venue. March 19: The Rouse Company discusses its efforts to get the state of Maryland to buy Merriweather Post Pavilion. Rouse executive Michael Spear notes that the responsibility for booking performers has left the Rouse Company “troubled by our ownership of the pavilion” ever since its creation, and that the pavilion has “lost several hundred thousand dollars since it opened”. Clark, Michael J. “Columbia pavilion up for sale.” Baltimore Sun, 20 Mar. 1975, p. D1. May: The Baltimore Symphony Orchestra schedules six summer concerts at Merriweather Post Pavilion. “Symphony slates summer concerts.” Baltimore Sun, 11 May 1975, p. D18. Crowd control problems continue at Merriweather Post Pavilion, and a new attraction opens near Symphony Woods. August 14: The Columbia Association bans trespassing in Symphony Woods during performances at Merriweather Post Pavilion. The ban is lifted less than two weeks later. Clark, Michael J. “Columbia revokes trespassing ban at Merriweather Post Pavilion.” Baltimore Sun, 25 Aug. 1977, p. 24C. “A Renaissance Festival: First Annual Renaissance Festival, Columbia, Maryland.” Baltimore Sun, 16 Sept. 1977, p. 5B. More potential competition for Merriweather Post Pavilion appears, then recedes. April 8: Consultants to Baltimore County, including Frank Gehry, recommend constructing a new performance center at Oregon Ridge Park to replace Merriweather Post Pavilion as the summer home of the Baltimore Symphony Orchestra. Advantages cited for the proposed center’s design include “better backstage facilities and wing and storage space than [Merriweather Post Pavilion]”. Pietila, Antero. “Build Oregon Ridge pavilion, consultants say.” Baltimore Sun, 9 Apr. 1978, p. A1. November 7: By a 59%-41% margin Baltimore County voters defeat a plan to borrow $4 million to build the proposed Oregon Ridge performance center. “Voting on Baltimore county questions.” Baltimore Sun, 9 Nov. 1978, p. A11. Jim Rouse leaves the company that bears his name, and Merriweather Post Pavilion sticks to non-rock fare as the Baltimore Symphony Orchestra considers leaving the pavilion. March: Howard County Executive J. Hugh Nichols announces that the county will not issue concert permits for Merriweather Post Pavilion until a security plan is in place to control access to the pavilion and Symphony Woods during concerts. “‘Security plan’ required for pavilion at Columbia.” Baltimore Sun, 13 Mar. 1979, p. 5C. May: Jim Rouse steps down as CEO of the Rouse Company. “Annual meeting marks end of an era for Rouse.” Baltimore Sun, 24 May 1979, p. 15A. June 1: With “people like Paul Anka, [Engelbert] Whatshisdink, Perry Como, George Benson, Chuck Mangione, [Joan] Baez, and Judy Collins”, critic Tom Basham criticizes “blandness” in Merriweather Post Pavilion’s summer schedule, with the pavilion “serving cold turkey to rock fans this year”. Basham, Tom. “Dog days lie ahead.” Baltimore Sun, 1 June 1979, p. B6. June 21: Baltimore Symphony Orchestra President Joseph Meyerhoff proposes a scaled-down pavilion for Oregon Ridge park as the new summer home for the BSO. Trammer, Monte L. “Pavilion plan considered in county.” Baltimore Sun, 22 June 1979, p. C22. Symphony Woods continues to function mainly as the entry way to Merriweather Post Pavilion, as the pavilion continues to compete with Oregon Ridge Park for classical performances. Juny 2: Critic Stephen Sera reviews Baltimore Symphony Orchestra summer concerts and praises the acoustic quality of Merriweather Post Pavilion compared to Oregon Ridge Park. Cera, Stephen. “BSO does justice to Tchaikovsky.” Baltimore Sun, 2 July 1980, p. C3. September: In the course of a dispute between the Columbia Association and the operators of Merriweather Post Pavilion, Lt. James Robey of the Howard County Police Department (and later Howard County Executive) testifies that without the closing of Symphony Woods before and during Merriweather performances “there will be no pavilion”. Members of the Columbia Association Board of Directors4 complain that as a result families can’t picnic in Symphony Woods most weekends during the summer. Garland, Jeanne. “Pavilion operators ask the council to eliminate fee for closing woods.” Baltimore Sun, Howard ed., 14 Sept. 1980, p. 3. November 4: By a margin of only 126 votes Baltimore County voters approve a $1.25 million bond issue to construct an Oregon Ridge performance center to be used by the Baltimore Symphony Orchestra. However the performance center fails to attract matching state funding. “Oregon Ridge barely won.” Baltimore Sun, 14 Nov. 1980, p. D2. Sin, Richard H.P. “Hutchinson drops bid for Oregon Ridge aid.” Baltimore Sun, 26 Feb. 1981, p. C20. Jim Rouse finds life after the Rouse Company, Michael and Barbara McCall move to Columbia as Michael begins working with Rouse, and the Baltimore Symphony Orchestra abandons Merriweather Post Pavilion. January: Jim and Patty Rouse found the non-profit Enterprise Foundation (later renamed Enterprise Community Partners) and its for-profit subsidiary, the Enterprise Development Company. Peirce, Neal R. “For the poorest.” Baltimore Sun, 18 Jan. 1982, p. 11A. Spring: Michael McCall and his wife Barbara move from Minneapolis to Columbia, and McCall joins the Enterprise Development Company as its fourth employee to work on various projects, including a joint venture with Walt Disney Co.
Lavoie, Luke. “‘An awesome responsibility’.” Columbia Flier, 14 Mar. 2013, p. 1. Strategic Leisure. “Who.” Strategic Leisure, strategicleisure.com/who. May 26: For the first time in almost a decade the Baltimore Symphony Orchestra does not play at Merriweather Post Pavilion, instead scheduling summer concerts at Oregon Ridge Park and Pier 6 at the Inner Harbor. Cera, Stephen. “Summer concerts set in 3 locations.” Baltimore Sun, 26 May 1982, p. C17. One of the last non-Merriweather attractions at or near Symphony Woods shuts down. April 5. Someone sets fire to the backstage area of Merriweather Post Pavilion, causing $250,000 damage. “Pavilion fire ruled arson.” Baltimore Sun, 7 Apr. 1983, p. D2. July: The petting zoo at Symphony Woods closes due to lack of interest. Wyskida, Sherry. “Declining attendance brings close of Children’s Zoo.” Baltimore Sun, Howard ed., 13 July 1983, p. 11. Symphony Woods loses another non-Merriweather attraction. February 28: The Maryland Renaissance Festival receives approval to move its operations from next to Symphony Woods to a dedicated site in Crownsville, Maryland. Clark, Michael J. “Renaissance festival gets OK for site.” Baltimore Sun, 1 Mar. 1985, p. 3D. Sarris, Marina. “Cultural diversity lost as Renaissance festival moves.” Baltimore Sun, Howard ed., 10 Mar. 1985, p. 2. The Rouse Company makes a first attempt at developing its property next to Symphony Woods, as Michael McCall strikes out on his own. March 19: The Howard County Council (acting as the Zoning Board) rejects a request from the Rouse Company to build 300 apartments in Columbia Town Center next to Merriweather Post Pavilion and Symphony Woods. Nelson, Erik. “Howard County officials trim plan for Columbia.” Baltimore Sun, Howard ed., 21 Mar. 1992, p. 2B. April: Michael McCall founds Strategic Leisure, Inc.
McCall, Michael. Personal communication. 27 May 2016. More than 25 years after its creation, interest grows in encouraging more use of Symphony Woods. May 15-16: The first Wine in the Woods festival is held in Symphony Woods. Nelson, Erik. “Wine gala is called a success.” Baltimore Sun, Howard ed., 17 May 1993, p. 1B. November: The Columbia Association contracts with Land Design Research (later renamed LDR International), a firm founded by former Columbia planner Cy Paumier and his associates, to study ways to increase the use of Symphony Woods. Sachs, Adam. “Citizens group aims to influence plan for Symphony Woods.” Baltimore Sun, Howard ed., 1 Dec. 1993, p. 3B. The first park plan for Symphony Woods appears, along with another new park attraction. November 10: LDR International presents the results of its study on development of Symphony Woods, recommending a pathway around the park with a more formal park entrance and boardwalks over environmentally sensitive areas, a formal garden and wildflower plantings, seating for picnickers, and a “sound garden” with hidden speakers or fountains. The plan is later estimated to cost $600,000. Sachs, Adam. “Path, boardwalk urged for Symphony Woods.” Baltimore Sun, Howard ed., 11 Nov. 1994, p. 1B. Sachs, Adam. “Cost of upgrading Symphony Woods estimated at $600,000.” Baltimore Sun, Howard ed., 12 Dec. 1994, p. 3B. December: The first Symphony of Lights display is held in and around Symphony Woods. “Drive through display of seasonal light scenes.” Baltimore Sun, Howard ed., 15 Nov. 1994, p. 6B. Development in downtown Columbia and Symphony Woods is stalled, and the future of Merriweather Post Pavilion is uncertain. February 16: LDR International again presents its plan for Symphony Woods at a public hearing sponsored by the Columbia Association, amid concerns that the plan is “too extravagant” and recommendations to “move slowly” on the project, citing (among other things) the fact that the park is closed for Merriweather Post Pavilion concerts during the summer. Only one resident attends the hearing. Sachs, Adam. “Council to begin deliberations tonight on Columbia Association budget.” Baltimore Sun, Howard ed., 16 Feb. 1995, p. 6B. Sachs, Adam. “Financial committee pans plan for recreational vehicle parking.” Baltimore Sun, Howard ed., 17 Feb. 1995, p. 3B. February 27: Amid resident concerns about spending increases the Columbia Association Board of Directors votes to cut the CA budget, deferring several capital projects including a $102,000 project to dredge the pond in Symphony Woods, the first phase of the park plan proposed by LDR International. Sachs, Adam. “Council adopts budget.” Baltimore Sun, Howard ed., 28 Feb. 1995, p. 1B. May: The Rouse Company asks Howard County for permission to build 345 apartments or condominiums next to Merriweather Post Pavilion and Symphony Woods. Nelson, Erik. “345 apartments proposed for Town Center.” Baltimore Sun, Howard ed., 16 May 1995, p. 1B. June: In his comments before the Howard County Planning Board regarding the Rouse Company’s rezoning request, Rouse executive Alton Scavo raises the possibility of Merriweather Post Pavilion being closed down, and also speculates about adding an arts, educational, and cultural center near the pavilion. Coram, James M., and Adam Sachs. “No overhaul of Pavilion is planned.” Baltimore Sun, Howard ed., 19 June 1995, p. 1B. July: The Howard County Planning Board rejects the Rouse Company’s proposal to develop apartments next to Merriweather Post Pavilion and Symphony Woods, citing the risk of the pavilion being forced to close due to noise complaints and the need to preserve downtown land for commercial development. Nelson, Erik. “Rouse plan for apartments near Post Pavilion denied.” Baltimore Sun, Howard ed., 30 July 1995, p. 3C. The end of an era in Columbia. April 9: Jim Rouse dies. Lally, Kathy. “Urban visionary succumbs at 81.” Baltimore Sun, 10 Apr. 1996, p. 1A. The Rouse Company attempts to address issues with Merriweather Post Pavilion. April: Contracts are signed for an initial set of renovations at Merriweather Post Pavilion, designed to help it compete with other venues. “Post Pavilion improvements will permit larger-scale acts.” Baltimore Sun, Howard ed., 23 Apr. 1997, p. 3B. October: As Merriweather Post Pavilion celebrates its 30th birthday, its size and outdated facilities make it less competitive compared to alternative venues like the new Nissan Pavilion (now Jiffy Lube Live) in northern Virginia. Hedgpeth, Dana. “Newer venues challenge pavilion.” Baltimore Sun, Howard ed., 20 Oct. 1997, p. 1B. Merriweather Post Pavilion sees a new operator, but plans to create a park in Symphony Woods provoke little interest. March: Concert promoter SFX International takes over operations at Merriweather Post Pavilion from the Nederlander organization. Neal, Jill Hudson. “Merriweather concert lease goes to SFX.” Baltimore Sun, 23 Mar. 1999, p. 2C. March 25: Cy Paumier and LDR International present to the Columbia Association a proposal to make Symphony Woods more accessible to visitors. Niedowski, Erika. “Columbia looks to improve access to Symphony Woods.” Baltimore Sun, Howard ed., 25 Mar. 1999, p. 3B. July 22: Cy Paumier and LDR International again present to the Columbia Association Board of Directors a proposal for Symphony Woods, and wait for the board to decide whether to begin discussions about it. Niedowski, Erika. “Symphony Woods renovation eyed.” Baltimore Sun, Howard ed., 23 July 1999, p. 1B. Niedowski, Erika. “Marando calls for council review.” Baltimore Sun, Howard ed., 13 Aug. 1999, p. 1B. The Rouse Company makes a last attempt at developing downtown Columbia and threatens to downsize Merriweather Post Pavilion, as others revive the idea of creating a park in Symphony Woods. March: The Rouse Company considers applying for permission to build more residential units in Columbia Town Center, and rumors circulate about the fate of Symphony Woods and Merriweather Post Pavilion. Cadiz, Laura. “Reconsidering Town Center.” Baltimore Sun, Howard ed., 23 Mar. 2003, p. 1B. April 21: The Rouse Company proposes adding 1,600 residential units in Columbia Town Center next to Symphony Woods and Merriweather Post Pavilion, helping to create a “vibrant urban center”. Cadiz, Laura. “Rouse subsidiary seeks OK for 2,141 more units.” Baltimore Sun, Howard ed., 1 May 2003, p. 1B. April 24: After two years of debate and discussion, the Columbia Association Board of Directors approves a strategic plan for CA, including a list of 19 priorities for 2004 and other items for future years. Developing Symphony Woods as a park is not among them. Cadiz, Laura. “Columbia Council lists its long-term goals.” Baltimore Sun, Howard ed., 1 May 2003, p. 3B. May 29: The Howard County Planning Board approves the Rouse Company’s request to add 2,141 new residential units, including about 1,600 units in Columbia Town Center. Rouse executive Dennis Miller pledges that units will not be built on the Merriweather Post Pavilion or Symphony Woods properties: “[Merriweather Post Pavilion] will always be used for the arts.” Miller later repeats the pledge to counter rumors that Merriweather Post Pavilion will be closed, although he notes that development could affect the pavilion’s parking lots. Cadiz, Laura. “Planning Board OKs additional housing units.” Baltimore Sun, Howard ed., 30 May 2003, p. 1B. Cadiz, Laura. “Merriweather Post rumors denied.” Baltimore Sun, Howard ed., 22 July 2003, p. 1B. July 23: The Rouse Company proposes converting Merriweather Post Pavilion into a year-round indoor theater, noting that the pavilion has been “deteriorating through the years.” Members of the recently-formed advocacy group Save Merriweather speak out against the plan. Cadiz, Laura. “Board delays Rouse hearings.” Baltimore Sun, Howard ed., 25 July 2003, p. 1B. Cadiz, Laura. “Theater proposed for Post Pavilion.” Baltimore Sun, Howard ed., 24 July 2003, p. 1B. Alexander, Sandy. “Fans want Merriweather to stay the same.” Baltimore Sun, Howard ed., 24 Aug. 2003, p. 1B. “History and accomplishments.” SaveMerriweather.com, Save Merriweather, 2004, www.savemerriweather.com/history.html. Accessed 11 May 2017. September-October: As the Howard County Council (in its role as the Zoning Board) conducts a series of contentious public hearings on the Rouse Company’s proposals, council member (and future County Executive) Ken Ulman and Columbia Association board member Joshua Feldmark attempt to revive the idea of developing Symphony Woods as a park, citing their rediscovery of LDR International’s 1999 proposal to CA. Cadiz, Laura. “Windfall seen in building proposal.” Baltimore Sun, Howard ed., 11 Sept. 2003, p. 1B. Cadiz, Laura. “Residents testify on Town Center proposal.” Baltimore Sun, Howard ed., 12 Sept. 2003, p. 1B. Cadiz, Laura. “Press Rouse for details on housing, panel told.” Baltimore Sun, Howard ed., 25 Sept. 2003, p. 1B. Cadiz, Laura. “A vision of ‘Central Park’ in Howard.” Baltimore Sun, Howard ed., 5 Oct. 2003, p. 1B. Carson, Larry, and Laura Cadiz. “Rouse Co. defends plan for zoning.” Baltimore Sun, Howard ed., 21 Oct. 2003, p. 1B. October: The Rouse Company hires I.M.P., the owner of the 9:30 Club in Washington DC, to manage Merriweather Post Pavilion, replacing Clear Channel Entertainment (formerly SFX Entertainment). Cadiz, Laura. “New Merriweather management.” Baltimore Sun, 15 Oct. 2003, p. 3E. November 3: The Howard County Council holds its eighth and final public hearing on the Rouse Company’s proposal to add more residential units in Columbia Town Center and elsewhere. Cadiz, Laura. “Eighth hearing held on rezoning.” Baltimore Sun, Howard ed., 4 Nov. 2003, p. 1B. The Rouse Company is absorbed into General Growth Properties, as the Howard County Council gets more involved in planning downtown Columbia and attendees see the first fruits of I.M.P.’s management of Merriweather Post Pavilion. January 21: The Howard County Council unanimously rejects the Rouse Company’s request to add 2,141 residential units to Columbia. Chair Ken Ulman cites the need for an analysis of possible revisions to Columbia’s New Town zoning scheme, as well as a desire for more details on pedestrian access, a possible Symphony Woods park, and other issues. Cadiz, Laura. “County board rejects Rouse’s downtown plan.” Baltimore Sun, Howard ed., 22 January 2004, p. 1B. Cadiz, Laura. “Zoning denial spurs doubts about Rouse.” Baltimore Sun, Howard ed., 25 Jan 2004, p. 1B. Pichaske, Pete. “Rejection could signal end of New Town zoning.” Columbia Flier, 29 Jan. 2004, p. 4. February-March: As the future of Merriweather Post Pavilion remains uncertain in the face of Rouse Company plans to convert it to an indoor theater, I.M.P. Productions previews its first season of events at the pavilion. Alexander, Sandy. “Venue posts concert dates.” Baltimore Sun, 5 Feb. 2004, p. 1E. Alexander, Sandy. “Merriweather Post holding on.” Baltimore Sun, 21 Mar. 2004, p. 62T. “Rouse Co. appeals rejection of its plan to add homes in Columbia Town Center.” Baltimore Sun, 8 Apr. 2004, p. 3B. Wan, William. “Judge to rule on fate of land next to Merriweather Post Pavilion.” Baltimore Sun, Howard ed., 13 Mar. 2005, p. 1G. Cadiz, Laura. “Plans for Columbia are moving forward.” Baltimore Sun, Howard ed., 14 Sept. 2005, p. 1G. June. The Howard County Council decides to undertake its own comprehensive analysis of Columbia’s New Town zoning regulations, while Howard County plans to study the feasibility of purchasing Merriweather Post Pavilion from the Rouse Company. Cadiz, Laura. “Council abandons plans for citizen zoning panel.” Baltimore Sun, Howard ed., 17 June 2004, p. 1B. Cadiz, Laura. “County weighs buying Merriweather.” Baltimore Sun, Howard ed., 24 June 2004, p. 1B. July: As I.M.P. works to make improvements to Merriweather Post Pavilion and increase revenue, Howard County Executive Jim Robey proposes financing a county purchase of the pavilion using ticket sales and concessions revenue. Alexander, Sandy. “Merriweather pavilion dances to a new theme.” Baltimore Sun, Howard ed., 1 July 2004, p. 1B. Cadiz, Laura. “Tickets seen as source of funds for pavilion.” Baltimore Sun, Howard ed., 4 July 2004, p. 1B. Cadiz, Laura. “Managers combat pavilion’s reputation.” Baltimore Sun, Howard ed., 25 July 2004, p. 1B. July 28: County Executive Jim Robey creates a citizens advisory panel to advise him on whether Howard County should purchase Merriweather Post Pavilion from the Rouse Company. Cadiz, Laura. “Robey names panel to study pavilion.” Baltimore Sun, 29 July 2004, p. 3B. August 20: General Growth Properties (GGP) announces its intent to acquire the Rouse Company for $12.6 billion. Rouse executive Bob Rubenkonig announces “it’s definitely business as usual” as far as plans for Columbia and Merriweather Post Pavilion are concerned. Hopkins, Jamie Smith. “Rouse to sell to competitor.” Baltimore Sun, 21 Aug. 2004, p. 1A. Cadiz, Laura. “Rouse plans survive sale.” Baltimore Sun, Howard ed., 24 Aug. 2004, p. 1B. September: As the Rouse Company renews I.M.P.’s contract to manage Merriweather Post Pavilion, I.M.P. co-owner Seth Hurwitz urges the citizens advisory panel on the pavilion to maintain it as an open-air venue, and pavilion manager Jean Parker points to the need for at least $5 million in repairs. Cadiz, Laura. “Firm that operates pavilion opposes plan to enclose it.” Baltimore Sun, Howard ed., 29 Sept. 2004, p. 1B. September 13: The Howard County Council begins a series of public hearings on proposals to revise zoning regulations for Columbia. Cadiz, Laura. “County holds zoning forum.” Baltimore Sun, Howard ed., 14 Sept. 2004, p. 1B. November 12: General Growth Properties concludes its purchase of the Rouse Company. As a consequence of the acquisition GGP assumes responsibility for planning in Columbia Town Center. Hopkins, Jamie Smith. “Rouse, real estate innovator, moves into history.” Baltimore Sun, 13 Nov. 2004, p. 11C. December: As General Growth Properties encounters resistance to its new role in Columbia, the Columbia Association proposes holding a weeklong “charrette” in which residents, developers, and county officials could create draft proposals for downtown Columbia development. Wan, William. “Rouse buyer meets friction.” Baltimore Sun, Howard ed., 19 Dec. 2004, p. 1B. “Columbia leaders propose a summit on land use.” Baltimore Sun, Howard ed., 17 Dec. 2004, p. 2B. December 17: As Howard County’s exclusive right to purchase Merriweather Post Pavilion expires, the citizens advisory panel on the pavilion issues its preliminary recommendations, advising against converting it to an indoor venue. The panel also offers suggestions on addressing future parking needs at Merriweather Post Pavilion, including entering into parking agreements with nearby office buildings or building parking garages on the Symphony Woods property. Wan, William. “Howard rights to venue set to expire.” Baltimore Sun, Howard ed., 19 Dec. 2004, p. 8B. Merriweather Post Pavilion is saved and is proposed as a center for culture and the arts for Columbia and Howard County, as GGP, Howard County, and others plot the future of Columbia’s downtown. January: The citizens advisory panel on Merriweather Post Pavilion prepares to make its final recommendations amid confusion and controversy about General Growth Properties’s plans for the pavilion and for downtown Columbia. Wan, William. “Fate of Merriweather Post Pavilion may be decided soon.” Baltimore Sun, Howard ed., 16 Jan. 2005, p. 1B. March 18: The citizens advisory panel on Merriweather Post Pavilion produces its final report, recommending that Howard County purchase the pavilion, and advising “positioning Merriweather as a center for the arts, education and culture and making it an important regional and cultural force.” The panel recommends making about $19.5 million in renovations to the pavilion, including raising its roof. Cadiz, Laura. “Panel recommends Howard buy pavilion.” Baltimore Sun, 19 Mar. 2005, p. 3B. Citizen Advisory Panel on Merriweather Post Pavilion. Final Report. Howard County, 2005, civilityandtruth.com/assets/texts/citizens-advisory-panel-on-merriweather-post-pavilion-final-report.pdf. Accessed 26 May 2017. April 11: Howard County Council members Guy Guzzone and Ken Ulman announce Howard County Executive Jim Robey’s decision to fund development of a community master plan for downtown Columbia, in parallel with efforts by General Growth Properties to develop its own plan. Cadiz, Laura. “2 Town Center plans coming.” Baltimore Sun, Howard ed., 13 Apr. 2005, p. 1G. Cadiz, Laura. “Mastering a plan for Columbia.” Baltimore Sun, Howard ed., 17 Apr. 2005, p. 1G. April 12: General Growth Properties abandons plans to convert Merriweather Post Pavilion into an indoor venue and subsequently takes the pavilion off the market, declaring that “the [Town Center and Merriweather Post Pavilion] are linked”. Cadiz, Laura. “Howard pavilion to stay open air.” Baltimore Sun, 13 Apr. 2005, p. 1B. Carson, Larry. “Downtown plan for Columbia tied to pavilion.” Baltimore Sun, 1 May 2005. p. 1G. May 18: General Growth Properties holds a public meeting to unveil a draft plan for downtown Columbia, including a proposed development of three buildings in the Crescent property south and west of Symphony Woods and Merriweather Post Pavilion. Cadiz, Laura, and Larry Carson. “Developer unveils its plan for Columbia.” Baltimore Sun, 19 May 2005, p. 1B. June: General Growth Properties holds public “town hall” meetings to present a framework for a future master plan for downtown Columbia and discuss issues of traffic and walkability. “You’re invited to attend the 2nd Columbia town hall meeting.” Baltimore Sun, 10 June 2005, p. 5G. October: Howard County sponsors a weeklong charrette, a series of public meetings (originally proposed by the Columbia Association) to solicit input on the future of downtown Columbia. Wheeler, Timothy B. “A ‘there’ there: Seeking a more urban Columbia.” Baltimore Sun, 2 Oct. 2005, p. 6F. Otto, Mary. “‘Whatever happened to Tivoli?’” Washington Post, 13 Oct. 2005. p. T12. Blakely, Andrei. “Charrette gives public voice in planning of downtown.” Columbia Flier, 13 Oct. 2005. Blakely, Andrei. “Mass input guides new downtown Columbia.” Columbia Flier, 20 Oct. 2005. A vision for downtown Columbia starts to form, as the Columbia Association pulls back on its participation in planning efforts and a new generation of Howard County politicians takes power. February 27: The Howard County Department of Planning and Zoning presents a draft master plan for downtown Columbia. It treats Symphony Woods, Merriweather Post Pavilion, and the Crescent property as an integrated neighborhood for planning purposes, and envisions it as “a cultural, residential, service retail, and office district”. It also suggests improving pedestrian access to Symphony Woods from the mall, and includes a rendering of a possible promenade from the mall terminating at a fountain in Symphony Woods just south of Little Patuxent Parkway. Cadiz, Laura. “Columbia plan is on way.” Baltimore Sun, Howard ed., 26 Feb. 2006, p. 1G. Design Collective, Inc., and Howard County Department of Planning and Zoning. The Columbia Downtown Master Plan (Preliminary Draft). Howard County, Maryland, 27 Feb. 2006, archive.org/details/CDMP1Intro. Accessed 11 May 2017. March 9: The Columbia Association Board of Directors debates a resolution to prohibit CA staff, including CA President Maggie Brown, from having private discussions with General Growth Properties and Howard County officials regarding downtown Columbia planning. The board votes to amend the resolution to instead require the staff to report on the times, places, and attendees for all such meetings, and not enter into any agreements without public review by the board. Even with the clarification provided by the resolution, confusion and controversy persist regarding the extent to which CA staff can or should discuss downtown Columbia planning issues with GGP, Howard County, or others. Columbia Association. Minutes, Board of Directors Meeting, Held: Thursday, March 9, 2006, Approved March 23, 2006. 23 Mar. 2006, p. 3. Columbia Association. Resolution on Downtown Partnership Meetings [as introduced]. 9 Mar. 2006. Columbia Association. Amendment to: Resolution on Downtown Partnership Meetings [as approved]. 9 Mar. 2006. Arney, June. “Much ado about meeting.” Baltimore Sun, Howard ed., 2 Apr. 2008, p. 2U. Arney, June. “CA board ‘off to a good start’.” Baltimore Sun, Howard ed., 28 May 2008, p. 3U. October 19: General Growth Properties and Howard Community College sponsor the first in a series of “Voices of Vision” presentations in which invited speakers present on topics relevant to Columbia downtime planning. Further events are held in November 2006 and January 2007. “Columbia: ‘Grow or die’.” Baltimore Sun, 22 Oct. 2006, p. 1G. November 7: Ken Ulman is elected Howard County Executive. Calvin Ball, Greg Fox, Mary Kay Sigaty, Jen Terrasa, and Courtney Watson are elected to the Howard County Council. Paley, Amit R. “Ulman wins as Democrats strengthen hold on council.” Washington Post, 8 Nov. 2006, p. A43. Downtown planning efforts continue, and identify Symphony Woods as a key component of the vision for downtown Columbia. September 28: The Howard County Department of Planning and Zoning releases a draft document Downtown Columbia: A Community Vision. Arney, June. “Howard releases ‘vision’ of town.” Baltimore Sun, 29 Sept. 2007, p. 1B. Howard County Department of Planning and Zoning. Downtown Columbia: A Community Vision (Draft). Howard County, Maryland, 28 Sept. 2007, archive.org/details/DCCVDraft092807All. Accessed 11 May 2017. November: Columbia Association board member Cynthia Coyle and Alex Hekimian and Alan Klein (of the advocacy groups Alliance for a Better Columbia and the Coalition for Columbia’s Downtown respectively) protest General Growth Properties scheduling private meetings with members of Columbia village boards to discuss downtown redevelopment, citing provisions of the Maryland Homeowners Association Act. Arney, June. “GGP is holding private meetings on Town Center.” Baltimore Sun, 14 Nov. 2007, p. 1G. December 10: Greg Hamm replaces Doug Godine as Regional Vice President of General Growth Properties and general manager of Columbia. Arney, June. “GGP selects Hamm for post.” Baltimore Sun, Howard ed., 12 Dec. 2007, p. 1G. December 28: The Howard County Department of Planning and Zoning releases the final version of Downtown Columbia: A Community Vision. It recommends “both woodland restoration [of Symphony Woods] to enhance its value as a natural area and additional activities to meet its full potential as the ‘Central Park’ for Downtown”. It also recommends a promenade connecting Symphony Woods to the mall. Arney, June. “A downtown re-vision.” Baltimore Sun, Howard ed., 30 Dec. 2007, p. 1G. Howard County Department of Planning and Zoning. Downtown Columbia: A Community Vision. Howard County, Maryland, 28 Dec. 2007, archive.org/details/DCCV2007. Accessed 11 May 2017. General Growth Properties promotes its new plan for downtown, including Symphony Woods, and the Columbia Association reacts. January: The Columbia Association adds a preliminary budget item for a new CA headquarters, possibly to be located on CA-owned land in Symphony Woods next to Toby’s Dinner Theater. Arney, June. “Association offers 2009, 2010 budgets.” Baltimore Sun, Howard ed., 16 Jan. 2008, p. 4U. Arney, June. “Trying to get Columbia on the right foot.” Baltimore Sun, Howard ed., 9 Mar. 2008, p. 8U. Arney, June. “Architect shares Town Center ideas.” Baltimore Sun, Howard ed., 11 Apr. 2008, p. 4U. April 3: General Growth Properties and the Columbia Association meet for the first time to discuss issues relating to downtown Columbia. Arney, June. “GGP, CA upbeat on meeting.” Baltimore Sun, Howard ed., 9 Apr. 2008, p. 3U. April 28: General Growth Properties presents to the public a proposed master plan for downtown Columbia. The plan proposes a “cultural spine” linking The Mall in Columbia with a renovated Merriweather Post Pavilion, including a pedestrian promenade from the mall to the pavilion, multiple civic and cultural buildings within Symphony Woods, and a new road south of and parallel to Little Patuxent Parkway. Arney, June. “GGP reveals downtown Columbia plan.” Baltimore Sun, 29 Apr. 2008, p. 2B. Gunts, Edward. “Putting a ‘there’ there.” Baltimore Sun, 5 May 2008, p. 1C. “Downtown Columbia Plan: Overview.” Columbia Town Center, General Growth Properties, columbiatowncenter.info/MasterPlan.aspx. Archived 9 May 2008. May 10: General Growth Properties begins a series of “Vision in Focus” public presentations describing the proposed master plan, as well as a separate “Community Discussions” series. Consultant Gail Dexter Lord emphasizes the need for new cultural attractions in downtown Columbia, as controversy arises over GGP’s proposal to put buildings on CA-owned land within Symphony Woods. Arney, June. “Future Columbia transit previewed for residents.” Baltimore Sun, Howard ed., 11 May 2008, p. 3U. Arney, June. “Culture is keynote of Columbia forum.” Baltimore Sun, Howard ed., 14 May 2008, p. 6U. Arney, June. “Residents give GGP proposal mixed reviews.” Baltimore Sun, Howard ed., 14 May 2008, p. 7U. May 22: The newly-elected Columbia Association Board of Directors meets and receives updates on the CA staff’s recent initial meeting with General Growth Properties. The CA board also authorizes making a formal request to Howard County officials to delay any zoning changes to give the board time to talk with officials. Board member Tom O’Connor notes that “we haven’t talked to them at all because we’ve had this embargo on [CA] staff talking to the county”. June 26: The Columbia Association Board of Directors adopts a seventeen point position statement crafted by the Planning and Strategy Committee that articulates CA’s position on desired outcomes for downtown development, including that “Symphony Woods will be protected and will serve as Columbia’s Community Park”. The board also approves sending a letter to Howard County and GGP outlining its position. Columbia Association. Minutes, Board of Directors Meeting, Held: Thursday, June 26, 2008, Approved August 28, 2008. 28 Aug. 2008, p. 5. July 11: General Growth Properties previews its planned rezoning submission to Howard County in a public meeting. Among other things, the plan proposes developing “culturally themed buildings and green spaces” in the northern portion of Symphony Woods. In response to a concern expressed about “the incredible shrinking Symphony Woods”, GGP Vice President Greg Hamm remarks that “Symphony Woods is a seriously degraded environment” and points to reforestation plans for woods along U.S. 29. Carson, Larry. “Views of the future.” Baltimore Sun, Howard ed., 11 July 2008, p. 4U. Restoration and maintenance of a vibrant and natural ecosystem. Provisions for a gathering place for individuals and community events. Merriweather Post Pavilion will be an exciting and active destination. Limited new roadways or buildings of a park-related scale. Connectivity and accessibility to the rest of the downtown. Columbia Association. Minutes, Board of Directors Meeting, Held: Thursday, July 24, 2008, Approved September 25, 2008. 25 Sept. 2008, p. 4. July 28: The newly formed advocacy group Columbia 2.0 announces its support for redevelopment of downtown Columbia. Carson, Larry. “Role by youth urged in Columbia’s plans.” Baltimore Sun, 29 July 2008, p. 2B. September 9: The newly-formed advocacy group Columbia Tomorrow meets in Symphony Woods to express support for the General Growth Properties proposal and for the restoration of what it calls an ”environmentally sensitive area that has been unintentionally neglected”. Carson, Larry. “New group backing Columbia proposal.” Baltimore Sun, Howard ed., 11 Sept. 2008, p. 1G. September 24: General Growth Properties Vice President Greg Hamm issues reassurances that GGP’s financial problems will not affect its plans for downtown Columbia redevelopment. Carson, Larry. “Developer about to redo Columbia faces cash crunch.” Baltimore Sun, 28 Sept. 2008, p. 8A. September 25: The Columbia Association Board of Directors approves having CA staff work with Cy Paumier and associates “to collaborate and work toward developing a best approach and budget estimate for CA to move forward with a plan/programming/design for CA property in the Downtown”. Columbia Association. Minutes, Board of Directors Meeting, Held: Thursday, September 25, 2008, Approved October 23, 2008. 23 Oct 2008, p. 4. October 1: General Growth Properties formally submits its General Plan Amendment, Zoning Regulations Amendment, and supplemental materials to the Howard County Department of Planning and Zoning. That evening Greg Hamm presents GGP’s proposals for downtown Columbia to the Columbia Association Board of Directors. Carson, Larry. “Makeover under way.” Baltimore Sun, 5 Oct. 2008, p. 1A. Columbia Association. Minutes, Board of Directors Special Meeting, Held: Wednesday, October 1, 2008, Approved December 23, 2008. 23 Dec. 2008, p. 1. Carson, Larry. “Makeover underway.” Baltimore Sun, Howard ed., 5 Oct. 2008, p. 1G. October 29: At a meeting sponsored by the advocacy group Coalition for Columbia’s Downtown, Alan Klein criticizes GGP plans to remove 40 percent of the trees in Symphony Woods, and Cy Paumier shows artist’s conceptions of an alternative proposal for Symphony Woods. Pitts, Jonathan. “Coalition critiques Columbia plan.” Baltimore Sun, Howard ed., 2 Nov. 2008, p. 2G. November 8: The Howard County Department of Planning and Zoning issues its Technical Staff Report in response to General Growth Properties’s submission. Among other things, DPZ recommends either finding alternative locations for buildings proposed in Symphony Woods or finding other replacement parkland. Pitts, Jonathan. “Howard planners give conditional OK to GGP proposal for Columbia.” Baltimore Sun, 11 Nov. 2008, p. 9A. Howard County Department of Planning and Zoning. Technical Staff Report, ZRA 113. Howard County, Maryland, 13 Nov. 2008, civilityandtruth.com/assets/texts/ZRA113StaffReport.pdf. Accessed 11 May 2017. Carson, Larry. “Session examines GGP zoning proposals for Columbia.” Baltimore Sun, Howard ed., 4 Dec. 2008, p. 1G. December 11: The Howard County Department of Planning and Zoning holds its first hearing to discuss the General Growth Properties submission to the Howard County Planning Board, as GGP seeks to address its financial problems. Pitts, Jonathan. “Specifics sought from GGP.” Baltimore Sun, Howard ed., 14 Dec. 2008, p. 1G. Walker, Andrea K., and Larry Carson. “Columbia developer trying to refinance.” Baltimore Sun, 13 Dec. 2008, p. 10A. December 23: The Columbia Association Board of Directors unanimously approves beginning work on a concept plan for Symphony Woods development. Columbia Association. Minutes, Board of Directors Meeting, Held: Tuesday, December 23, 2008, Approved January 22, 2009. 22 Jan. 2009, p. 4. Howard County evaluates and reworks the General Growth Properties plan, while the Columbia Association moves forward with its own plans for a park in Symphony Woods. Meanwhile architectural critic Roger Lewis revisits Columbia’s progress after 20 years and recommends “making [Columbia] denser … with a greater variety of uses in order to create destinations where you want to be 24/7 and 365”. Carson, Larry. “Dispute on downtown Columbia.” Baltimore Sun, Howard ed., 11 Jan. 2009, p. 3G. Holzberg, Janene. “Rethinking Columbia.” Baltimore Sun, Howard ed., 11 Jan. 2009, p. 1G. January 22: Former Columbia Association board member Jud Malone (a founder of the advocacy group Columbia Tomorrow) recommends that CA turn Symphony Woods over to Howard County for conversion into a public park. Carson, Larry. “Columbia developer agrees to lower-cost housing.” Baltimore Sun, Howard ed., 25 Jan. 2009, p. 2G. February: Cy Paumier and associates announce they are working on a new plan for Symphony Woods for consideration by the Columbia Association. Simmonsen, Derek. “CA devising alternative plan for Symphony Woods.” Columbia Flier, 5 Feb. 2009. March 26: The Columbia Association Board of Directors unanimously approves a Symphony Woods concept plan created by Cy Paumier, John Slater, and associates, and directs that it be presented to the general public. Columbia Association. Minutes, Board of Directors Meeting, Held: Thursday, March 26, 2009, Approved June 25, 2009. 25 June 2009, p. 3. April 16: General Growth Properties files for Chapter 11 bankruptcy as concerns are raised about GGP’s ability to pursue the redevelopment of downtown Columbia. Walker, Andrea K. “General Growth Properties seeks bankruptcy protection.” Baltimore Sun, 17 Apr. 2009, p. 1A. Carson, Larry. “Columbia plan in danger?” Baltimore Sun, 17 Apr. 2009, p. 1A. May 1: Phil Nelson becomes the new President of the Columbia Association. Carson, Larry. “Residents meet CA’s new head.” Baltimore Sun, 28 June 2009, p. 2G. June 1: Merriweather Post Pavilion managers unveil $1 million worth of updates to the pavilion, including expanded bathrooms and a new concession stand. “Merriweather has a lot to crow about.” Baltimore Sun, 2 June 2009, p. 12A. August 27: The Columbia Association Board of Directors unanimously approves sending a letter to the Howard County Planning Board notifying it of CA’s intention to present a concept plan for Symphony Woods. Columbia Association. Minutes, Board of Directors Meeting, Held: Thursday, August 27, 2009, Approved September 24, 2009. 24 Sept. 2009, p. 4. Columbia Association. Letter to Howard County Planning Board. Aug. 2009. September 3: The Howard County Planning Board approves the conceptual portion of the General Growth Properties plan for downtown Columbia. Carson, Larry. “Columbia remake moves forward.” Baltimore Sun, Howard ed., 6 Sept. 2009, p. 3G. September 16: The Columbia Association presents to the public the concept plan developed by Cy Paumier, John Slater, and associates for development of Symphony Woods, including a formal pathway system, a fountain, a café, “Woodland Garden”, and a 120-space parking lot. Coyle, Cynthia. “CA’s proposed design plan for Symphony Woods PARK.” Howard County Blog, 17 Sept. 2009, howardcountyblog.blogspot.com/2009/09/cas-proposed-design-plan-for-symphony.html. Accessed 24 July 2011. “CA officials plan to turn Symphony Woods into a park.” Columbia Flier, 18 Sept. 2009. Markus, Don. “Revitalization sought for Symphony Woods.” Baltimore Sun, 18 Oct. 2009, p. 1. November 2: Howard County Council Chair Mary Kay Sigaty formally introduces Council Bills 58 and 59 (CB-58-2009 and CB-59-2009), legislation for the Downtown Columbia Plan and the associated zoning regulations. Howard County Council. Bill No. 58-2009, AN ACT adopting the Downtown Columbia Plan, a General Plan Amendment for the purpose of revitalizing and redeveloping Downtown Columbia; and generally relating to the Downtown Columbia Plan, a General Plan Amendment. Howard County, Maryland, 3 Feb. 2010, apps.howardcountymd.gov/olis/GetFile.aspx?id=6249. Accessed 6 May 2017. Howard County Council. Bill No. 59-2009, AN ACT amending the Howard County Zoning Regulations to create a new Downtown Columbia revitalization process in the New Town District; defining new terms; establishing a new residential density for Downtown Columbia; establishing new land use percentages for open space in Downtown Columbia; establishing an affordable housing provision for Downtown Columbia revitalization; establishing new off-street parking requirements for Downtown Columbia revitalization; and generally relating to the New Town zoning district. Howard County, Maryland, 3 Feb. 2010, apps.howardcountymd.gov/olis/GetFile.aspx?id=6326. Accessed 6 May 2017. November 23: Lawyers assure the Howard County Council that the proposed plan for downtown Columbia will remain enforceable even in the event of General Growth Properties selling all or part of its holdings. Carson, Larry. “Plan for Columbia safe, council told.” Baltimore Sun, Howard ed., 29 Nov. 2009, p. 4G. December 2. At a Howard County Council meeting to discuss plans for downtown Columbia redevelopment, Philip Kirsch, Chair of the Columbia Association Board of Directors, and General Growth Properties Vice President Greg Hamm exchange accusations about lack of communications and GGP’s alleged desire to take CA land to expand Merriweather Post Pavilion. Carson, Larry. “Tension surfaces over pavilion.” Baltimore Sun, Howard ed., 6 Dec. 2009, p. 1G. December 8: Columbia Association President Phil Nelson and General Growth Properties Vice President Greg Hamm assure the Howard County Council that CA and GGP will cooperate on negotiating any necessary easements as part of renovating Merriweather Post Pavilion. Carson, Larry. “Clearing the air on redevelopment.” Baltimore Sun, Howard ed., 13 Dec. 2009, p. 4G. Howard County officially adopts a new plan for downtown Columbia, including integrating Merriweather Post Pavilion and Symphony Woods, and the Columbia Association continues its own park project. January: The Columbia Association budgets an initial $2.3 million for development of Symphony Woods Park, as the Howard County delegation to the Maryland General Assembly approves a local bond bill for $250,000 in funding for the park. Carson, Larry. “Columbia cuts gym towels from budget.” Baltimore Sun, 16 Jan. 2010, p. 2A. Carson, Larry. “Money matters, but it might not be enough this year.” Baltimore Sun, Howard ed., 24 Jan. 2010, p. 3G. Carson, Larry. “Columbia to undergo urban transformation.” Baltimore Sun, 2 Feb. 2010, p. 1A. Downtown Columbia Plan: A General Plan Amendment. Howard County, Maryland, 1 Feb. 2010, archive.org/details/downtown_columbia_plan. Accessed 6 May 2017. April: The Maryland General Assembly approves $250,000 in funding for the Columbia Association’s development of Symphony Woods. Carson, Larry. “Battle on liquor license limits moves to new front.” Baltimore Sun, Howard ed., 18 Apr. 2010, p. 3G. May 15-16: The Wine in the Woods festival features a new layout, chosen in anticipation of the Columbia Association beginning work on Symphony Woods development. Holzberg, Janene. “Celebration in Symphony Woods boasts a new layout.” Baltimore Sun, Howard ed., 9 May 2010, p. 1G. May 18: Columbia Association President Phil Nelson announces that an anonymous nonprofit from outside Howard County will donate $250,000 to support development of Symphony Woods as a park. Carson, Larry. “Donor gives money for Symphony Woods project.” Baltimore Sun, 23 May 2010, p. 7G. May 20: Columbia Association President Phil Nelson informs the Board of Directors of a potential county roadblock to CA’s development of Symphony Woods, based on the need to follow after or coordinate with the plans of General Growth Properties. Columbia Association. Minutes of the Board of Directors Meeting, May 20, 2010, Approved: June 10, 2010. 10 June 2010, p. 1. July: General Growth Properties prepares to split itself into two entities, with GGP retaining ownership of The Mall in Columbia, and ownership of Merriweather Post Pavilion and undeveloped land in downtown Columbia being transferred to a new entity. Gunts, Edward, and Larry Carson. “General Growth prepares to split.” Baltimore Sun, 14 July 2010, p. 14A. September 2: Faced with the need to dredge Lake Kittamaqundi, the Columbia Association contemplates taking money from the budget for the delayed Symphony Woods Park project. Carson, Larry. “More funds to dredge proposed.” Baltimore Sun, Howard ed., 5 Sept. 2010, p. 2G. November 2: Ken Ulman is re-elected as Howard County Executive. Incumbents Calvin Ball, Greg Fox, Mary Kay Sigaty, Jen Terrasa, and Courtney Watson are all re-elected to the Howard County Council. Carson, Larry. “‘Satisfied’ Howard voters stay with the incumbents.” Baltimore Sun, 7 Nov. 2010, p. 2. November 9: The Howard Hughes Corporation is spun out of General Growth Properties, and assumes GGP’s responsibilities for planning in Columbia Town Center. General Growth Properties. “General Growth Properties Completes Spinoff of The Howard Hughes Corporation.” 9 Nov. 2010, investor.howardhughes.com/phoenix.zhtml?c=241177&p=irol-newsArticle_print&ID=1494391. Accessed 6 May 2017. November 26: As the Howard Hughes Corporation moves forward with its plans for downtown Columbia redevelopment, the Columbia Association schedules work on the Symphony Woods Park project to begin in December 2011. Carson, Larry. “Columbia plan for downtown picks up.” Baltimore Sun, 27 Nov. 2010, p. 3A. December: Merriweather Post Pavilion is named one of the top three amphitheaters in the country by Billboard magazine. McPherson, Lindsey. “Billboard: Merriweather Post rocks.” Columbia Flier, 2 Dec. 2010, p. 1. The Columbia Association unveils its plan for a park in Symphony Woods, but encounters problems in taking the plan through Howard County’s new and more rigorous planning process. March 7: The Howard County Council approves a new set of design guidelines for downtown Columbia, removing one potential roadblock to redevelopment of downtown Columbia, including Symphony Woods. Carson, Larry. “Council OKs Columbia sign rules.” Baltimore Sun, Howard ed., 13 Mar. 2011, p. 4G. Howard County Council. CR138-2010, A RESOLUTION adopting Downtown-wide Design Guidelines for Downtown Columbia. Howard County, Maryland, 7 Mar. 2011, apps.howardcountymd.gov/olis/LegislationDetail.aspx?LegislationID=1101. Accessed 7 May 2017. Howard County Department of Planning and Zoning. Downtown Columbia Design Guidelines: Downtown-Wide. Howard County, Maryland, Nov. 2010, www.howardcountymd.gov/LinkClick.aspx?fileticket=fcdab7B57Cs%3d&portalid=0. Accessed 7 May 2017. April: John DeWolf replaces Greg Hamm as the Regional Vice President of the Howard Hughes Corporation responsible for development of downtown Columbia. Carson, Larry. “He’s set to move quickly on Columbia changes.” Baltimore Sun, 6 May 2011, p. 8A. McPherson, Lindsey. “DeWolf eager to dive into downtown redevelopment.” Columbia Flier, 12 May 2011, p. 4. June 9: The Columbia Association Board of Directors unanimously approves the so-called “Plan B” layout for development of Symphony Woods. Columbia Association. Minutes of the Board of Directors Meeting, June 9, 2011, Approved: June 23, 2011. 23 June 2011, p. 3. June 16: In accordance with the new development review process for downtown Columbia, the Columbia Association hosts a pre-submission community meeting to present its plans for Symphony Woods. CA notes that $1.2 million in funding for the first phase of the project is included in the 2011 capital budget, and another $1.4 million in the 2012 budget, in addition to a $250,000 Maryland state grant and a matching $250,000 donation promised by an anonymous donor. Toth, Sara. “CA presents plans for Symphony Woods.” Columbia Flier, 23 June 2011, p. 16. Howard County Department of Planning and Zoning. Land development review process for downtown Columbia revitalization. Howard County, Maryland, Nov. 2010, www.howardcountymd.gov/LinkClick.aspx?fileticket=_oT1cawSChY%3d&portalid=0. Accessed 27 May 2017. Subsequently Barbara McCall brings to the attention of her husband Michael a Columbia Flier article on the Design Advisory Panel review. He agrees with what he reads as the DAP’s concerns, but assumes that CA will make appropriate adjustments to the proposed park design. Toth, Sara. “Design panel advises stronger vision for Symphony Woods.” Columbia Flier, 21 July 2011, p. 6. Columbia Association. Symphony Woods Park in Columbia Town Center: Design Advisory Panel Meeting for Final Development Plan. 13 July 2011, inartrust.org/s/DAP-meeting-7-13-11-copy-2.pdf. Accessed 7 May 2017. Hollis, Rob. Design Advisory Panel 07-13-2011, Symphony Woods Park - Phase 1. 13 July 2011, inartrust.org/s/DAP-review-of-CA-plan-copy-2.pdf. Accessed 7 May 2017. McCall, Michael. Personal communication. 27 May 2017. August 11: The Columbia Association Board of Directors considers updated plans for Symphony Woods and a revised vision statement for the park, and discusses architectural details of park facilities and potential uses. CA President Phil Nelson urges board members to focus on the plans for the first phase. Toth, Sara. “Carousel for Symphony Woods? CA to study.” Columbia Flier, 18 Aug. 2011, p. 13. September 22: The Columbia Association Board of Directors votes 7-2 to approve the Final Development Plan for Symphony Woods as presented. During the “resident speak out” portion of the same meeting Michael McCall, in his first public comments on Columbia, advocates for CA creating an overall strategy for all of Symphony Woods before deciding on the tactics by which to implement such a strategy. Greisman, David. “CA says yes to first phase of Symphony Woods Park.” Columbia Flier, 29 Sept. 2011, p. 1. Columbia Association. Minutes of the Board of Directors Meeting, September 22, 2011, Approved: October 27, 2011. 27 Oct. 2011, pp. 2-5. October 13: Having approved the Symphony Woods Park plan and already specified the park’s benches and furniture, the Columbia Association Board of Directors votes 8-2 to adopt a formal vision statement for Symphony Woods. In the audience is Michael McCall, who sees CA’s actions as contrary to the strategic planning principles he learned while working with Jim Rouse and the Walt Disney Company, especially given his view of the importance of the Symphony Woods property to the future of downtown Columbia. Columbia Association. Minutes of the Board of Directors Meeting, October 13, 2011, Approved: October 27, 2011. 27 Oct. 2011, pp. 2-5. October-November: In the wake of the October 13 meeting of the Columbia Association Board of Directors, Michael McCall meets with George Barker, his mentor and former manager at the Enterprise Development Company, former General Counsel of Howard Research and Development, and (along with Emily Lincoln) a leader of the advocacy group Bring Back the Vision. After hearing McCall’s concerns about CA’s plans Barker volunteers to introduce McCall to Howard County Executive Ken Ulman, and with Lincoln reviews McCall’s presentation for that meeting. McCall, Michael. Tribute delivered by McCall to George Penniman Barker’s family, colleagues & lifelong friends. 3 June 2016, static1.squarespace.com/static/51e1bf57e4b0e2abc3e95f77/t/579e8dd81b631bd12f0cbc79/1470008793102/George+Barker+Tribute+statement.pdf. Accessed 27 May 2016. November 18: Michael McCall, George Barker, and Emily Lincoln meet with Howard County Executive Ken Ulman, Jessica Feldmark and Ian Kennedy of the Howard County Executive staff, and Marsha McLaughlin and Bill Mackey, Director and Division Chief respectively of the Howard County Department of Planning and Zoning. McCall presents his criticisms of the Columbia Association’s plan for Symphony Woods. December: The Howard County Department of Planning and Zoning provides the Columbia Association comments and questions on CA’s submission for the Final Development Plan for Symphony Woods Park. As with CA’s previous FDP submission, most of the DPZ comments and questions concern the park’s relationship to and integration with Merriweather Post Pavilion, including access points from the park to the pavilion. Greisman, David. “County: Plan for Symphony Woods Park needs fine-tuning.” Columbia Flier, 22 Dec. 2011, p. 14. Howard County mandates changes to the Symphony Wood Park project, the Columbia Association board and staff discuss how to proceed, and an alternative appears. January 3: Michael McCall meets for the first time with John DeWolf, Regional Vice President of the Howard Hughes Corporation, to discuss plans for the Merriweather-Symphony Woods neighborhood. January 26: The Columbia Association Board of Directors reviews plans for a proposed fountain in Symphony Woods and offers critiques of the design. Greisman, David. “Reviews mixed for planned fountain.” Columbia Flier, 2 Feb. 2012, p. 1. February 6. The Columbia Association Board of Directors considers setting aside $1.4 million toward construction of a new CA headquarters, location to be determined. Greisman, David. “CA could begin saving for new headquarters.” Columbia Flier, 9 Feb. 2012, p. 6. February 22. The Columbia Association Board of Directors includes a total of $1.6 million for Symphony Woods park development in CA’s 2013 and 2014 budgets. Greisman, David. “CA adopts budget with spending cut.” Columbia Flier, 1 Mar. 2012, p. 8. March: The Columbia Association submits a revised Final Development Plan for Symphony Woods Park to the Howard County Department of Planning and Zoning, as part of Howard County’s new 16-step process for reviewing proposed developments in downtown Columbia. The revised plan includes mention of proposed park facilities usable by visitors to both Symphony Woods and Merriweather Post Pavilion, including an amphitheater, a pavilion, and a café, reflecting CA staff discussions with the Howard Hughes Corporation, owner of the Merriweather Post Pavilion property. Greisman, David. “Symphony Woods plan awaits OK.” Baltimore Sun, Howard ed., 11 Mar. 2012, p. 3G. Rector, Kevin. “Downtown disconnect.” Columbia Flier, 1 Mar. 2012, p. 1. May 8: Michael McCall meets for the first time with Columbia Association President Phil Nelson to discuss plans for the Merriweather-Symphony Woods neighborhood. July 12: The Columbia Association presents its Final Development Plan for Symphony Woods (FDP-DC-MSW-1) to the Howard County Planning Board. The presentation focuses on plans for a fountain and a formal pathway system, requiring the removal of up to 64 trees. Future possibilities noted in the plan include a woodland garden, amphitheater, children’s activity area, and picnic area, as well as a café and other facilities that could be shared with Merriweather Post Pavilion. McPherson, Lindsey. “Planning Board weighs Symphony Woods plan.” Columbia Flier, 19 July 2012, p. 12. Columbia Association. FDP-DC-MSW-1, Downtown Columbia, Merriweather-Symphony Woods Neighborhood, Final Development Plan, Town Center, Section 1, Area 1, Lot 23. 3 May 2012, archive.org/detail/FDP-DC-MSW-1. Accessed 7 May 2017. July 19: The Howard County Planning Board considers the Final Development Plan for the Columbia Association proposal for Symphony Woods (FDP-DC-MSW-1) and approves it conditional on various changes being made, including rerouting paths to avoid tree removal and developing a plan for integration of Symphony Woods with Merriweather Post Pavilion. McPherson, Lindsey. “Phase one of Symphony Woods redesign approved.” Columbia Flier, 26 July 2012, p. 12. McPherson, Lindsey. “Planning Board has suggestions for Symphony Woods changes.” Columbia Flier, 26 July 2012, p. 13. August 23: The Columbia Association Board of Directors hears a staff recommendation to put development plans for Symphony Woods on hold pending more information on Howard Hughes Corporation plans for redeveloping Merriweather Post Pavilion. Lavoie, Luke. “CA weighs putting Symphony Woods projects on hold.” Columbia Flier, 30 Aug. 2012, p. 4. September 6: The Howard County Planning Board issues its final decision and order relating to the Final Development Plan for the Columbia Association proposal for Symphony Woods (FDP-DC-MSW-1). The decision and order requires the Columbia Association to revise the FDP to state that “tree removal shall be minimized by aligning paths around healthy trees and minimizing grading”, and to work with the Howard Hughes Corporation to develop a “coordinated plan for the [Merriweather-Symphony Woods] neighborhood” based on a “shared vision and design for Merriweather-Symphony Woods as a unique cultural and community amenity”. Howard County Planning Board. The Columbia Association, Petitioner before the Planning Board of Howard County, MD, Planning Board Case No. 394, Decision and Order. Howard County, Maryland, 6 Sept. 2012, inartrust.org/s/Planning-Board-Decision-and-Order-9612.pdf. Accessed 7 May 2017. September 25: Columbia Association President Phil Nelson sends a letter to the CA Board of Directors recommending that they devote time in October and November to discussing how to proceed with development of Symphony Woods, including whether and how CA might participate in some sort of Trust partnership with Howard Hughes Corporation and Howard County for the Merriweather-Symphony Woods Neighborhood, and whether CA should try to develop a new plan for Symphony Woods taking into account plans for Merriweather Post Pavilion. Nelson, Phil. “Placing the Board Committee Process Temporarily on Hold.” Columbia Association, 25 Sept. 2012, inartrust.org/s/10112-BOC-Staff-Item-re-Policy-Sessions.pdf. Accessed 7 May 2017. October 5: Columbia Association President Phil Nelson sends a letter to the CA Board of Directors containing several questions for the board to discuss in the wake of the Planning Board’s “decision and caveats” and other factors affecting the future of the Merriweather-Symphony Woods neighborhood, including whether to continue with the previous plan or do something different. Nelson, Phil. “Discussion cover memo regarding CA’s future involvement in the Symphony Woods/Merriweather Post Neighborhood.” Columbia Association, 5 Oct. 2012. October 11: The Columbia Association Board of Directors discusses whether to work with Howard Hughes Corporation and Howard County to create a separate organization (“trust”) to develop Symphony Woods. In an informal “straw vote”, the board members present unanimously agree to explore the proposal. Lavoie, Luke. “CA explores agreement to coordinate Symphony Woods redevelopment.” Columbia Flier, 18 Oct. 2012, p. 13. Columbia Association. Minutes of the Board of Directors Meeting, October 11, 2012, Approved: October 25, 2012. 25 Oct. 2012, p. 3. Stack, Andy. “Background on CA and Inner Arbor Trust.” Blog of Dr. Chao Wu, 15 Sept. 2015, chaowu.org/2015/10/07/background-on-ca-board-inner-arbor. Accessed 7 May 2017. October: Columbia Association President Phil Nelson asks Michael McCall for advice regarding development of Symphony Woods, and McCall volunteers to create an alternative plan. McCall, Michael. Letter to Jessamine Duvall. 27 May 2014, p. 3, inartrust.org/s/Letter-on-the-Progress-and-History-of-the-Inner-Arbor-Trust-140527.pdf. Accessed 7 May 2017. The Columbia Association charges the Inner Arbor Trust with responsibility for creating a park in Symphony Woods, and the Trust goes to work amid controversy about CA’s decision. Lavoie, Luke. “Columbia is planning an arts district.” Baltimore Sun, 19 Jan. 2013, p. 2A. Lavoie, Luke. “Hearing set on new Symphony Woods plan.” Columbia Flier, 24 Jan. 2013, p. 4. Lavoie, Luke. “Excitement, caution for Symphony Woods proposal.” Columbia Flier, 31 Jan. 2013, p. 6. January 31: Michael McCall again presents the Inner Arbor concept plan in a public meeting sponsored by the Columbia Association. Hirsch, Arthur. “New proposal for Columbia.” Baltimore Sun, Howard ed., 3 Feb. 2013, p. 1G. Lavoie, Luke. “Columbia Association hosts public unveiling of Symphony Woods plan.” Columbia Flier, 7 Feb. 2013, p. 8. February 7: Columbia Association President Phil Nelson sends a letter to the CA Board of Directors recommending that CA establish a separate organization to develop Symphony Woods according to the conceptual plan proposed by Michael McCall. Nelson, Phil. “Formation of a Trust for Symphony Woods Development.” Columbia Association, 13 Feb. 2013, inartrust.org/s/3-Formation_of_a_Trust_for_Symphony_Woods_Development.pdf. Accessed 7 May 2017. February 13: Columbia Association President Phil Nelson publishes an updated version of his letter of February 7, with additional details on and clarifications regarding his recommendations for Symphony Woods. February 14: The Columbia Association Board of Directors votes 8-2 to establish the Inner Arbor Trust, grant it a perpetual easement to develop Symphony Woods, and provide $1.6 million in initial funding. Lavoie, Luke. “CA board nearing vote on Symphony Woods plan.” Columbia Flier, 14 Feb. 2013, p. 4. Lavoie, Luke. “‘Done deal’ vote advances Symphony Woods plan.” Columbia Flier, 21 Feb. 2013, p. 4. Columbia Association. Minutes of the Board of Directors Meeting, February 14, 2013, Approved: February 28, 2013. 28 Feb. 2013, inartrust.org/s/Approved-BOD-Minutes-2013_02_14.pdf. Accessed 7 May 2017. April 4. Cy Paumier and associates present a revised version of their park design, touting it as compatible with the Inner Arbor concept plan. In response Michael McCall cites the Howard County Planning Board mandate to preserve trees by routing pathways around them. Lavoie, Luke. “New pitch for Symphony Woods fountain, cafe.” Columbia Flier, 28 Mar. 2013, p. 4. 28 March. The Columbia Association Board of Directors elects Ed Coleman and Gregg Schwind as its representatives on the Inner Arbor Trust Board of Directors. They join Phil Nelson, who holds an ex officio seat on the board as CA President. Lavoie, Luke. “Schwind and Coleman elected to Inner Arbor Trust.” Columbia Flier, 4 Apr. 2013, p. 16. April. The Inner Arbor plan becomes an issue in Columbia Association elections, with both supporters and opponents claiming victories. Lavoie, Luke. “Inner Arbor plan heats up CA election.” Columbia Flier, 11 Apr. 2013. p. 1. Lavoie, Luke. “CA board members debate meaning of elections.” Columbia Flier, 2 May 2013, p. 16. April 25. Howard County Executive Ken Ulman reiterates his support for the Inner Arbor plan, and proposes $5 million in county funding for downtown Columbia arts and cultural programs and facilities. May 10: The Inner Arbor Trust officially begins life as an organization with the election of a seven-member Board of Directors, the appointment of Michael McCall as President and CEO, and adoption of bylaws. Besides Ed Coleman, Gregg Schwind, and Phil Nelson of the Columbia Association, other board members include Deborah Ellinghaus, Kent Humphries, Gill Wylie, and Beverly White-Seals. Lavoie, Luke. “Board of Inner Arbor Trust expands to seven members.” Columbia Flier, 30 May 2013, p. 13. Inner Arbor Trust. “Inner Arbor Trust Inc., the not-for-profit developer of Symphony Woods, was formed in Columbia, Maryland.” 28 May 2013, inartrust.org/s/Inner-Arbor-Trust-Press-Release-Bios-52813-0ydu.pdf. Accessed 7 May 2017. May 23: As part of the FY2014 capital and expense budget (CB25-2013) the Howard County Council approves up to $3.5 million in funding for construction of the Chrysalis amphitheater. Howard County Council. Council Bill 25-2013, AN ACT adopting the current expense budget and the capital budget for the fiscal year beginning July 1, 2013, and ending June 30, 2014, to be known as the Budget and Appropriation Ordinance of Howard County, Fiscal Year 2014. Howard County, Maryland, May 2013, apps.howardcountymd.gov/olis/LegislationDetail.aspx?LegislationID=202. Accessed 8 May 2017. June: Merriweather Post Pavilion is named the fourth-best amphitheater in the U.S. by Rolling Stone magazine. Case, Wesley. “Columbia pavilion named top venue.” Baltimore Sun, Howard ed., 30 June 2013, p. 1G. September 20: Michael McCall presents the Inner Arbor concept plan to Leadership Howard County and discusses the selection of the design team, including initial members Martha Schwartz Partners and Mahan Rykiel Associates. McCall, Michael. “Introduction of Inner Arbor Trust to Leadership Howard County 9/20/13.” Vimeo, 20 Sept. 2013, vimeo.com/78288327. Accessed 7 May 2013. October: Martin Knott replaces Kent Humphries on the Inner Arbor Trust Board of Directors. Lavoie, Luke. “Inner Arbor Trust Inc. replaces board member.” Columbia Flier, 31 Oct. 2013, p. 13. October 30: Columbia celebrates the 50th anniversary of Jim Rouse’s announcement of his plan for Columbia, with development efforts underway or proposed at or near The Mall in Columbia and Lake Kittamaqundi, in Symphony Woods, and in the Crescent property south of Merriweather Post Pavilion and Symphony Woods. Hirsch, Arthur. “At 50, Columbia still a vision in progress.” Baltimore Sun, 30 Oct. 2013, p. 1A. November: The Inner Arbor Trust announces the selection of landscape designer Martha Schwartz as the lead designer for phase 1 of the Inner Arbor project. Lavoie, Luke. “Inner Arbor hires designer for Symphony Woods.” Columbia Flier, 7 November 2013, p. 6. November 18: At a public meeting the Inner Arbor Trust introduces the selected design team (“designers of delight”) at a public meeting. The team includes Martha Schwartz Partners, Marc Fornes of THEVERYMANY, Mimi Hoang and Eric Bunge of nArchitects, Arup, and Mahan Rykiel Associates. Lavoie, Luke. “Inner Arbor Trust introduces design team.” Columbia Flier, 21 Nov. 2013, p. 8. Inner Arbor Trust. “Unabashed Designers of Delight.” Vimeo, 18 Nov. 2013, vimeo.com/191568080. Accessed 8 May 2017. December 2: The Inner Arbor Trust presents the new Inner Arbor plan to the public at a pre-submission meeting prior to presenting the plan to the Howard County Design Advisory Panel and submitting a Site Development Plan (SDP) to the Howard County Department of Planning and Zoning. Features include the Chrysalis amphitheater, the Butterfly guest services building, the “art of bounds” Caterpillar berm, the Picnic Table, the Play Maze, Word Art, and Letter Garden. Lavoie, Luke. “Praise, questions for Inner Arbor plans.” Columbia Flier, 5 Dec. 2013, p. 1. Lavoie, Luke. “Trust envisions Symphony Woods as Merriweather Park.” Columbia Flier, 5 Dec. 2013, p. 18. Inner Arbor Trust. “Development of Symphony Woods: Site Development Plan (SDP) Public Meeting.” 2 Dec. 2013, inartrust.org/s/A-Inner-Arbor-Trust-Community-Meeting-Minutespdf-copy.pdf. Accessed 8 May 2017. Columbia Association and Inner Arbor Trust. Amended and Restated Declaration of Restrictive Covenants and Easement Agreement. 14 Mar. 2014, inartrust.org/s/IAT-001.pdf. Accessed 8 May 2017. December 18: The Inner Arbor Trust executes a $3.5 million grant agreement with Howard County. December 28: The Inner Arbor Trust submits its IRS Form 1023 application for tax exempt status. The Inner Arbor Trust finalizes the design for the first seven phases of the new park and successfully shepherds its plan through the Howard County planning process, as renovations for Merriweather Post Pavilion are planned and funded and Howard Hughes Corporation unveils its plans for developing the area around Symphony Woods. January 31: The Inner Arbor Trust receives official 501(c)(3) tax-exempt status from the IRS. Inner Arbor Trust. “A brief history of the Inner Arbor Trust (through October, 2015).” Oct. 2015, inartrust.org/s/A-Brief-History-of-the-Trust-October-2015-v3.pdf. Accessed 8 May 2017. February: Howard County Executive Ken Ulman presses the Howard Hughes Corporation on its plans for renovating Merriweather Post Pavilion, as required by the Downtown Columbia Plan and recommended by a report from consultants Ziger/Snead. Lavoie, Luke. “Ulman presses developer on future of Merriweather.” Columbia Flier, 13 Feb 2014, p. 6. Ziger/Snead. Merriweather Post Pavilion Physical Review Update (Draft). Feb. 2014, civilityandtruth.com/assets/texts/140214-draft-merriweather-physical-update-report.pdf. Accessed 26 May 2017. February 4: The Inner Arbor Trust submits the Site Development Plan for the northern portion of Symphony Woods to the Howard County Department of Planning and Zoning. Lavoie, Luke. “Inner Arbor unveils plan.” Baltimore Sun, Howard ed., 16 Feb. 2014, p. 1G. February 19: The Inner Arbor Trust publishes the final form of the Inner Arbor plan for the northern portion of Symphony Woods, adding the Merriground play area and the Merriweather Horns sound sculptures, and dropping the Play Maze, Word Art, and Letter Garden. Lavoie, Luke. “Playscape, audio added to Symphony Woods plan.” Columbia Flier, 20 Feb. 2014, p. 14. Holzberg, Janene. “A sound vision for Columbia.” Baltimore Sun, Howard ed., 2 Mar. 2014, p. 1G. February 26: The Howard County Design Advisory Panel reviews the final Inner Arbor plan and unanimously supports it as submitted, with panel members praising the design. Lavoie, Luke. “Inner Arbor plans ‘wow’ panel.” Columbia Flier, 6 Mar. 2014. p. 13. Howard County Design Advisory Panel. “Meeting Summary, February 26, 2014.” Howard County, Maryland, 26 Feb. 2014, inartrust.org/s/DAPsum-2014-2-26.pdf. Accessed 8 May 2017. March: After noting the Inner Arbor Trust’s use of the name “Merriweather Park” in its submissions to the Howard County Department of Planning and Zoning, the Columbia Association asks the Trust to retain the name Symphony Woods when referring to the property. Subsequently the Inner Arbor Trust adopts the name “Merriweather Park at Symphony Woods”. Lavoie, Luke. “CA vows to keep Symphony Woods name.” Columbia Flier, 27 Mar. 2014, p. 6. March 13: Howard County Executive Ken Ulman proposes to move up the date when ownership of Merriweather Post Pavilion will be transferred to the nonprofit Downtown Columbia Arts and Culture Commission. Soon afterwards the county and Howard Hughes Corporation begin discussions about pavilion renovations. Lavoie, Luke. “Bill would impact Merriweather ownership.” Columbia Flier, 20 Mar. 2014, p. 4. Lavoie, Luke. “Ulman shows optimism about Merriweather.” Columbia Flier, 27 Mar. 2014, p. 28. March 26. The Inner Arbor Trust Board of Directors appoints board member and local businessperson Martin Knott as Chair of the Trust. March 31. At a pre-submission community meeting the Howard Hughes Corporation presents plans for developing the Crescent property to the south and west of Symphony Woods. Lavoie, Luke. “Urban streetscape planned for crescent property.” Columbia Flier, 20 Mar. 2014, p. 6. Lavoie, Luke. “Downtown plans draw concerns about traffic and tall buildings.” Columbia Flier, 3 Apr. 2014, p. 16. April: The Inner Arbor Trust releases a report on its efforts to improve the environmental health of Symphony Woods, including planting 200 new trees (to replace 31 trees to be removed) and restoring stream beds in the eastern part of Symphony Woods. Lavoie, Luke. “Inner Arbor plans include adding trees.” Columbia Flier, 17 Apr. 2014, p. 4. April 10: The Columbia Association selects Nancy McCord to be one of its two representatives on the Inner Arbor Trust Board of Directors, replacing Ed Coleman. Lavoie, Luke. “McCord elected to Inner Arbor Trust.” Columbia Flier, 1 May 2014, p. 12. Columbia Association. Minutes of the Board of Directors Meeting, Held: April 10, 2014, Approved: April 24, 2014. 24 Apr. 2014, pp. 4-5. 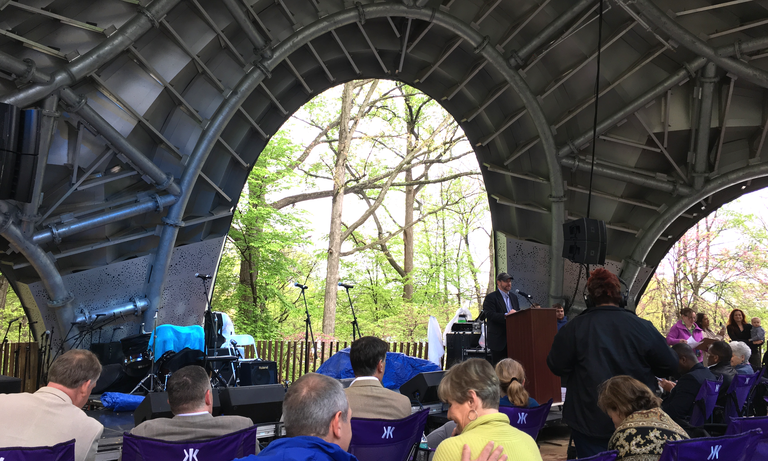 April 14: Howard County, Howard Hughes Corporation, and the Downtown Columbia Arts and Culture Commission sign a memorandum of understanding regarding a five-year, $19 million renovation plan for Merriweather Post Pavilion. Lavoie, Luke. “Agreement heralds Merriweather renovation.” Columbia Flier, 22 May 2014, p. 4. April 26. The Inner Arbor plan again becomes an issue in Columbia Association elections marked by low turnout. Lavoie, Luke. “Ketley, Lein, Schwind win Columbia elections.” Columbia Flier, 1 May 2014, p. 13. April 28: The Inner Arbor Trust formally submits its Site Development Plan (SDP) to the Howard County Department of Planning and Zoning. May 21: The Howard County Council approves County Executive Ken Ulman’s recommendation of an additional $1.5 million of funding for the Inner Arbor Trust in the form of a challenge grant. The Council also approves $10 million in funding for Merriweather Post Pavilion renovations and the Downtown Columbia Arts and Culture Commission. Yeager, Amanda. “County Council passes 2015 budget.” Baltimore Sun, Howard ed., 25 May 2014, p. 1G. Howard County Council. Council Bill 24-2014, AN ACT adopting the current expense budget and the capital budget for the fiscal year beginning July 1, 2014 and ending June 30, 2015, to be known as the Annual Budget and Appropriation Ordinance of Howard County, Fiscal Year 2015. Howard County, Maryland, May 2014, apps.howardcountymd.gov/olis/LegislationDetail.aspx?LegislationID=800. Accessed 8 May 2017. May 28: The Boards of Directors of the Columbia Association and the Inner Arbor Trust hold a joint meeting to discuss the progress of the Inner Arbor plan. Lavoie, Luke. “Columbia Association, Inner Arbor meet.” Baltimore Sun, Howard ed., 1 June 2014, p. 4G. Lavoie, Luke. “Symphony Woods plan subject of gathering.” Columbia Flier, 5 June 2014, p. 15. June: Howard County Executive Ken Ulman joins with musician Jack Johnson to preview plans for renovations at Merriweather Post Pavilion, as newly-arrived Howard Hughes Corporation Vice President Greg Fitchitt gets credit for helping to negotiate the plans with the county, and Howard Hughes signs a development agreement with the Downtown Columbia Arts and Culture Commission, the future owners of the pavilion. Lavoie, Luke. “Merriweather renovation plans rolled out.” Columbia Flier, 12 June 2014. p. 4. Lavoie, Luke. “Fitchitt new face of Howard Hughes.” Columbia Flier, 12 June 2014, p. 8. Lavoie, Luke. “Howard Hughes, arts commission sign Merriweather deal.” Columbia Flier, 26 June 2014, p. 8. June 2: Milton Matthews becomes the new President of the Columbia Association, replacing Phil Nelson. Lavoie, Luke. “Partnerships key for new CA president.” Columbia Flier, 10 July 2014, p. 4. June 12: The Columbia Association Board of Directors discusses whether the current form of the Inner Arbor plan is a “material change” from that described in the easement granted the Inner Arbor Trust. By a 7-3 vote the board decides that it is not. Columbia Association. Minutes of the Board of Directors Meeting, Held: June 12, 2014, Approved: June 26, 2014. 26 June 2014, pp. 2, 4-5. July 10: After a presentation by Michael McCall of the Inner Arbor Trust, the Columbia Association Board of Directors votes 6-4 to endorse the Inner Arbor Plan as currently conceived. Yeager, Amanda. “CA endorses Symphony Woods plan.” Columbia Flier, 17 July 2014, p. 6. Columbia Association. Minutes of the Board of Directors Meeting, Held: July 10, 2014, Approved: July 24, 2014. 24 July 2014, p. 3. August 7: Karen Newell is elected to the Inner Arbor Board of Directors. McCall, Michael. Personal communication. 9 Jan. 2016. October: The Boards of Directors of the Columbia Association and the Inner Arbor Trust hold another joint meeting to discuss the progress of the Inner Arbor plan, including phasing of park development, fundraising, and negotiation of an agreement with I.M.P., the operators of Merriweather Post Pavilion, for use of the Chrysalis amphitheater. Lavoie, Luke. “Symphony Woods development nears start.” Columbia Flier, 23 Oct. 2014, p. 8. November 4: Allan Kittleman is elected as Howard County Executive. Incumbents Calvin Ball, Greg Fox, Mary Kay Sigaty, and Jen Terrasa are re-elected to the Howard County Council, and are joined by newly elected council member Jon Weinstein. Wood, Pamela. “Republican Kittleman beats Watson in executive race.” Baltimore Sun, 5 Nov. 2014, p. 1A. November 20: After delaying its decision a week to allow more time for public testimony, the Howard County Planning Board unanimously approves the Inner Arbor Trust’s Site Development Plan for Merriweather Park at Symphony Woods (SDP-14-073). The Planning Board approves the design concepts, uses, and locations of park features for all seven proposed phases, and fully approves phases 1 and 2 (including the Chrysalis amphitheater) for construction. Lavoie, Luke. “Planning Board tables Inner Arbor decision.” Columbia Flier, 13 Nov. 2014, p. 4. Lavoie, Luke. “Initial Inner Arbor phases approved”. Baltimore Sun, 23 Nov. 2014, p. 1G. Lavoie, Luke. “Inner Arbor wins Planning Board approval.” Columbia Flier, 27 Nov. 2014, p. 6. Inner Arbor Trust. SDP-14-073, Downtown Columbia, Merriweather-Symphony Woods Neighborhood, Merriweather Park at Symphony Woods Phase 1 & Future Phases 2-7. inartrust.org/s/Part-1-of-5-SDP-14-073-R1.pdf, inartrust.org/s/Part-2-of-5-SDP-14-073-R1-copy-2.pdf, inartrust.org/s/Part-3-of-5-SDP-14-073-R1.pdf, inartrust.org/s/Part-4-of-5-SDP-14-073-R1.pdf, inartrust.org/s/Part-5-of-5-SDP-14-073-R1.pdf. Accessed 8 May 2017. The Inner Arbor Trust lays the groundwork for the start of Chrysalis construction and continues working with others to integrate Merriweather Park at Symphony Woods with Merriweather Post Pavilion. Lavoie, Luke. “Merriweather renovations poised to start.” Columbia Flier, 29 Jan. 2015, p. 10. March 6: The Inner Arbor Trust enters into a long-term operating agreement with It’s My Amphitheater, Inc., relating to joint use of Merriweather Post Pavilion and Merriweather Park at Symphony Woods. Under the agreement I.M.A. agrees to compensate the Trust for future use of Merriweather Park at Symphony Woods for Merriweather Post Pavilion events. The agreement also makes public areas of Merriweather Post Pavilion accessible to visitors outside of pavilion events. Inner Arbor Trust and I.M.A. License, Easement and Operating Agreement. 6 March, 2015, inartrust.org/s/IAT-IMA-Operating-Agreement-Executed-31615.pdf. Accessed 8 May 2017. March 19. The Howard County Planning Board approves the Final Development Plan for the Howard Hughes Corporation’s project to develop the Crescent property south and west of Symphony Woods. Yeager, Amanda. “Crescent plan given nod by Planning Board.” Columbia Flier, 26 Mar. 2015, p. 4. April: The first phase of renovations at Merriweather Post Pavilion is well underway. Ames, Blair. “Let the music begin.” Columbia Flier, 23 Apr. 2015, p. 28. April 15: Dave Sciamarelli is elected to the Inner Arbor Trust Board of Directors. April 25: Columbia Association board elections again see low turnout. Any controversies over Symphony Woods go unmentioned in newspaper accounts. Yeager, Amanda. “Boulton, Evans win contested CA races.” Columbia Flier, 30 Apr. 2015, p. 4. May 22: At the request of Howard County Executive Allan Kittleman, the Howard County Council approves $1.4M for the Inner Arbor Trust in support of construction of the Chrysalis amphitheater and related purposes, as part of the FY16 Expense and Capital Budget (CB23-2015). Yeager, Amanda. “Kittleman proposes $1B operating budget.” Columbia Flier, 23 Apr. 2015, p. 6. Howard County Council. Council Bill 23-2015, AN ACT adopting the current expense budget and the capital budget for the fiscal year beginning July 1, 2015 and ending June 30, 2016, to be known as the Annual Budget and Appropriation Ordinance of Howard County, Fiscal Year 2016. Howard County, Maryland, 22 May 2015, apps.howardcountymd.gov/olis/LegislationDetail.aspx?LegislationID=1390. Accessed 8 May 2017. May 27: The Inner Arbor Trust enters into a reciprocal easement agreement with Howard Hughes Corporation subsidiaries Merriweather Post Business Trust and Howard Research and Development relating to joint use of Merriweather Post Pavilion and Merriweather Park at Symphony Woods. Inner Arbor Trust, Merriweather Post Business Trust, and Howard Research and Development Corporation. Reciprocal Easement Agreement. 27 May 2015, inartrust.org/s/IAT-MPBT-HRD-REA-HoCo-Recorded-60315-copy.pdf. Accessed 8 May 2017. May 28: The Inner Arbor Trust appoints Nina Basu as General Counsel and Kirsten Coombs as treasurer. August: After years of discussion about where to locate a new headquarters for the Columbia Association (including the possibility of building one on CA-owned land in Symphony Woods), CA moves to leased space in an office building off Broken Land Parkway. Yeager, Amanda. “Columbia Association to move its headquarters.” Columbia Flier, 20 Aug. 2015, p. 12. September: After a competitive bidding process the Inner Arbor Trust selects Whiting-Turner as general contractor for all Chrysalis construction except for the Chrysalis shell itself (to be fabricated and installed by A. Zahner Company). Inner Arbor Trust. “September, 2015 Chrysalis Development Report.” 1 Oct. 2015, inartrust.org/s/Inner-Arbor-Trust-Update-as-of-October-2015.pdf. Accessed 8 May 2017. September 1: The Inner Arbor Trust enters into a licensing agreement with Howard Hughes Corporation subsidiary Merriweather Post Business Trust for use of the word mark “Merriweather” in connection with Merriweather Park at Symphony Woods. Inner Arbor Trust and Merriweather Post Business Trust. Trademark License Agreement. 1 Sept. 2015, inartrust.org/s/Trademark-License-Agreement-Merriweatehr-Hughes-Executed.pdf. Accessed 8 May 2017. September 3: The Howard County Planning Board approves FDP-DC-MSW-1A, a comprehensive Final Development Plan for the Merriweather-Symphony Woods Neighborhood submitted jointly by the Inner Arbor Trust and subsidiaries of the Howard Hughes Corporation. The plan modifies the previous FDP-DC-MSW-1 for Symphony Woods to be consistent with the previously-approved Site Development Plan SDP-14-073 for Merriweather Park at Symphony Woods, and improve integration of the park with Merriweather Post Pavilion. Howard County Department of Planning and Zoning. Technical Staff Report, Merriweather Symphony Woods Neighborhood, Planning Board Hearing of September 3, 2015, Case No. PB 416. Howard County, Maryland, www.howardcountymd.gov/LinkClick.aspx?fileticket=LK3Z4voZgec%3d&portalid=0. Accessed 11 May 2017. Howard County Planning Board. “Planning Board Past Meetings.” Howard County, Maryland, 3 Sept. 2015, www.howardcountymd.gov/Departments/Planning-and-Zoning/Boards-and-Commissions/Planning-Board. Accessed 8 May 2017. September 9: The Howard County Design Advisory Panel considers plans for further renovations to Merriweather Post Pavilion, including a raised roof and a larger stage house, and offers some minor suggestions. Howard County Design Advisory Panel. Meeting Summary, September 9, 2015. Howard County, Maryland, 9 Sept. 2015, http://www.howardcountymd.gov/DesktopModules/DnnSharp/SearchBoost/FileDownload.ashx?file=11432&sb-inst=9164. Accessed 11 May 2017. September 12: The Inner Arbor Trust holds a groundbreaking ceremony for the Chrysalis amphitheater. Michaels, Andrew. “Amphitheater underway in Symphony Woods.” Columbia Flier, 17 Sept. 2015, p. 4. September 18: The Inner Arbor Trust executes a new amendment to its grant agreement with Howard County to reflect the additional funding of $1.4 million from the county. Howard County, Maryland, and Inner Arbor Trust. Amendment Three to Grant Agreement. 18 Sept. 2015, inartrust.org/s/Amendment-3-to-Grant-Agreement-9-18-2015.pdf. Accessed 8 May 2017. October: Howard County issues permits to the Inner Arbor Trust for grading of the Chrysalis site and construction of the foundation. Inner Arbor Trust. “October, 2015 Chrysalis Development Report.” 1 November 2015, inartrust.org/s/Inner-Arbor-Trust-Update-as-of-November-2015.pdf. Accessed 8 May 2017. November 3: The Inner Arbor Trust sponsors the “Math of Architecture and Architecture of Math” public event with Joni Newkirk of Integrated Insight, Inc., and Bill Zahner of A. Zahner Co.
Michaels, Andrew. “Pair join Merriweather Park design team.” Columbia Flier, 29 Oct. 2015, p. 17. Holzberg Janene. “Chrysalis is seen as a huge draw.” Baltimore Sun, Howard ed., 8 Nov. 2015, p. 1G. Inner Arbor Trust. “Math of Architecture, Architecture of Math, November 3, 2015.” Vimeo, 3 Nov. 2015, vimeo.com/155286541. Accessed 8 May 2015. November-December: Whiting-Turner continues construction work on the Chrysalis foundation, including constructing a cistern to control storm water runoff, pouring “mud mats” for the foundation, and laying underground electrical conduits. Inner Arbor Trust. November & December, 2015 Chrysalis Development Report. 20 Dec. 2015, http://inartrust.org/s/Inner-Arbor-Trust-Update-as-of-November-2015-3oxn.pdf. Accessed 8 May 2017. December 17: The Howard County Planning Board approves SDP-16-018, a joint site development plan for improvements to Merriweather Post Pavilion and Merriweather Park at Symphony Woods, including shared restrooms, accessible paths, and handicap parking spaces. Howard County Department of Planning and Zoning. Technical Staff Report, Merriweather Post Pavilion and Merriweather Park at Symphony Woods, Downtown Columbia - Merriweather Symphony Woods Neighborhood, Planning Board Meeting of December 17, 2015, Case No. : SDP-16-018. Howard County, Maryland, 3 Dec. 2015, www.howardcountymd.gov/LinkClick.aspx?fileticket=Hylr2WVK7HA%3d&portalid=0. Accessed 8 May 2017. Inner Arbor Trust and Merriweather Post Business Trust. SDP-16-018, Site Development Plan, Merriweather Post Pavilion & Merriweather Park at Symphony Woods, Town Center, Section 1, Lots 13 & 23, Redevelopment Phase 2 & 3. Jan. 2016, inartrust.org/s/MPBT-IAT-Joint-SDP-16-018.pdf. Accessed 9 May 2017. Chrysalis construction proceeds apace in concert with Merriweather Post Pavilion renovations. January: The Inner Arbor Trust sponsors an event “Let there be light” featuring the work of Arup lighting designer Star Davis. Unfortunately it is cancelled due to a major snowstorm. Holzberg, Janene. “At Symphony Woods, lighting design comes alive.” Columbia Flier, 28 Jan. 2016, p. 4. February: Construction of the Chrysalis is well underway, with completion estimated for the spring of 2017. Whiting-Turner is placing rebar and pouring concrete for the piers and walls of the subfloor, while Arup and Zahner are preparing “shop drawings” (in digital form) for the steel framework and aluminum skin. Michaels, Andrew. “Chrysalis construction making headway.” Columbia Flier, 25 Feb. 2016, p. 4. Inner Arbor Trust. Report on the Chrysalis Development. 15 Feb. 2016, inartrust.org/s/Inner-Arbor-Trust-Update-as-of-February-2016.pdf. Accessed 9 May 2017. March: The steel tubes making up the steel framework of the Chrysalis are fabricated by the Walters Group, as Whiting-Turner continues work on the walls and piers of the concrete subfloor. Meanwhile renovations at Merriweather Post Pavilion continue as the stage house is replaced. Inner Arbor Trust. Report on the Chrysalis Development. 15 Mar. 2016, inartrust.org/s/Inner-Arbor-Trust-Update-as-of-March-2016.pdf. Accessed 9 May 2017. Michaels, Andrew. “Merriweather revamping sound monitoring.” Columbia Flier, 10 Mar. 2016, p. 4. April: Zahner fabricates the ZEPPS panels and aluminum shingles of the Chrysalis skin, while Whiting-Turner nears completion of the concrete subfloor. Inner Arbor Trust. Report on the Chrysalis Development. 15 Apr. 2016, inartrust.org/s/Inner-Arbor-Trust-Update-as-of-April-2016.pdf. Accessed 9 May 2017. May 3: The Inner Arbor Trust signs an agreement with Howard County for use of the Chrysalis during Wine in the Woods and other events. Inner Arbor Trust and Howard County, Maryland. Chrysalis Use Agreement. 3 May 2016, inartrust.org/s/Chrysalis-Use-Agreement-Fully-Executed-51116.pdf. Accessed 9 May 2017. May 12: The Columbia Association Board of Directors selects Lin Eagan and Gregg Schwind to be its representatives on the Inner Arbor Trust Board of Directors. Columbia Association. Minutes of the Board of Directors Meeting, Held: May 12, 2016, Approved: May 26, 2016. 26 May 2016, p. 2. June: Metropolitan Walters, part of the Walters Group, erects the steel framework of the Chrysalis while skin fabrication continues at Zahner. Inner Arbor Trust. Chrysalis Construction. 15 July 2016, inartrust.org/s/Inner-Arbor-Trust-Chrysalis-June-update-copy.pdf. Accessed 9 May 2017. July: Howard County Executive Allan Kittleman proposes to provide $90 million via a “tax increment financing” plan to fund development of infrastructure for downtown Columbia, including a parking garage to support visitors to Merriweather Post Pavilion and Merriweather Park at Symphony Woods. Waseem, Fatimah. “Project finance plan offered.” Baltimore Sun, Howard ed., 3 July 2016, p. 1G. August: Metropolitan Walters completes erection of the steel framework of the Chrysalis. ZEPPS panels from Zahner arrive on the construction site and are beginning to be installed. Meanwhile Howard Hughes Corporation’s first building in the Crescent development nears its opening date as the second building is under construction. Inner Arbor Trust. Chrysalis Construction. 15 Aug. 2016, inartrust.org/s/Inner-Arbor-Trust-Chrysalis-August-update.pdf. Accessed 9 May 2017. Waseem, Fatimah. “$41M Columbia office building to open in ’17.” Baltimore Sun, Howard ed., 21 Aug. 2016, p. 1G. September: Zahner continues installing ZEPPS panels, including fabricating some panels on site. Inner Arbor Trust. Chrysalis Construction. 15 Sept. 2016, inartrust.org/s/Inner-Arbor-Trust-Chrysalis-September-Update-copy.pdf. Accessed 9 May 2017. October: Zahner installs the last of the ZEPPS panels on the steel framework of the Chrysalis, and begins installing the green aluminum shingles forming the outer surface of the Chrysalis skin. The Howard County Council considers a public financing plan to help fund infrastructure improvements for downtown Columbia, including a new 2,545-space parking garage to serve Merriweather Post Pavilion and Merriweather Park at Symphony Woods. Inner Arbor Trust. Chrysalis Construction. 15 Oct. 2016, inartrust.org/s/Inner-Arbor-Trust-Chrysalis-September-Update-draggedjpg-4dbe.pdf. Accessed 9 May 2017. Wood, Pamela. “Howard weighs financing option for Columbia plan.” Baltimore Sun, 11 Oct. 2016, p. 1A. Waseem, Fatima. “TIF for core under scrutiny.” Baltimore Sun, Howard ed., 16 Oct. 2016, p. 1G. November: More than half of the surface of the Chrysalis has been covered with green aluminum shingles, with Zahner projected to finish the work in December. Inner Arbor Trust. Chrysalis Construction. 15 Nov. 2016, inartrust.org/s/Inner-Arbor-Trust-Chrysalis-October-Update-sm.pdf. Accessed 11 May 2017. November 2: Mary Ann Scully, CEO of Howard Bank, is elected to the Inner Arbor Trust Board of Directors, as Howard Bank pledges to contribute $50,000 to the Trust. Inner Arbor Trust. “The Inner Arbor Trust unanimously elects Howard Bank’s CEO Mary Ann Scully to its Board of Directors.” 17 Nov. 2016, inartrust.org/s/Mary-Ann-Sculley-Press-Release-November-17-2016.pdf. Accessed 9 May 2017. Inner Arbor Trust. November 2, 2016 Board Minutes. 2 Nov. 2016, inartrust.org/s/Inner-Arbor-Trust-November-2-2016-Minutes.pdf. Accessed 9 May 2017. November 30: Howard Hughes Corporation transfers ownership of Merriweather Post Pavilion to the nonprofit Downtown Columbia Arts and Culture Commission. Waseem, Fatimah. “Merriweather Post eyes its new future.” Baltimore Sun, Howard ed., 4 Dec. 2016, p. 1G. The Chrysalis comes to life and a new era begins for the Inner Arbor Trust. March 18: At the recommendation of Michael McCall the Inner Arbor Trust Board of Directors elects Trust General Counsel Nina Basu to succeed McCall as President and CEO of the Trust, effective May 1. The board also elects Eric Metzman as a new board member, replacing retiring original board member Gill Wylie. April: The Maryland General Assembly approves a $150,000 grant to the Inner Arbor Trust in support of the Chrysalis. Yeager, Amanda. “Session makes a local impact.” Baltimore Sun, Howard ed., 16 Apr. 2017, p. 1G. April 22: The Chrysalis is dedicated with a public ceremony and concert. Holzberg, Janene. “Park by day, public sculpture by night.” Baltimore Sun, 16 Apr. 2017, p. 1 (A&E). Janney, Elizabeth. “Chrysalis dedicated to people of Columbia.” Columbia Patch, 24 Apr. 2017, patch.com/maryland/columbia/chrysalis-dedicated-people-columbia. Accessed 8 May 2017. May 1: Michael McCall steps down as President and CEO of the Inner Arbor Trust, after successfully leading the Trust through its formation as a nonprofit organization and achievement of 501(c)(3) tax-exempt status, the selection of a design team and creation of a detailed plan for the northern portion of Merriweather Park at Symphony Woods, the approval of a seven-phase Site Development Plan by Howard County (including concepts and locations for all park features), the execution of legal agreements with the Columbia Association, Howard County, the Howard Hughes Corporation, and It’s My Amphitheater, Inc., and the completion of phase 1 of the Site Development Plan, including the construction of the Chrysalis. He is succeeded by former Trust General Counsel Nina Basu. Basu, Nina. “Started working at Inner Arbor Trust.” Facebook, 1 May 2017, www.facebook.com/ninabasu/timeline/story?ut=32&wstart=-2051193600&wend=2147483647&hash=10155301230471913&pagefilter=3&ustart=1&pnref=story. Accessed 26 May 2017. The completed Chrysalis, viewed from the beta stage. (Click for a higher-resolution version.) Image © 2017 Frank Hecker; available under the terms of the Creative Commons Attribution 4.0 International License. In writing the “Creating the Chrysalis” series and this timeline I consulted multiple sources both online and offline. Unfortunately almost all of the online sources available have one or more flaws, including being incomplete, overly expensive, lacking adequate search facilities, or being prone to broken links as the underlying sites are revamped. At times my only option was to manually scroll through microfilm at the Central Branch of the Howard County Library System. The standard Baltimore Sun search page linked to from the main newspaper web site includes results for the Columbia Flier and Howard County Times, but will only return results within the last couple of years. It also lacks critical features like being able to search within a date range; even the function to sort results by date is broken. A Google search against the Baltimore Sun site will typically return many more useful results than searching on the Baltimore Sun site itself. The official Baltimore Sun archives (maintained by Newspapers.com) has excellent historical coverage (back to 1837) and can be used to obtain full images of the printed papers, including photographs and illustrations. Searches can be restricted to a date range and results sorted by date. Snippets of the results are viewable at no charge; full pages may be viewed for $8 per month for an unlimited number of searches. Indexing of articles is generally excellent; however, in some cases articles cannot be found using the most straightforward query but will show up using a slightly different query. Columbia Flier and Howard County Times. The archives for the Columbia Flier and Howard County Times are combined with Baltimore Sun archives for recent years. For articles before that time there is no option at present except to look for articles on microfilm. There used to be a site archives.explorehoward.com that provided access to earlier articles. However it no longer exists, and its contents are not archived anywhere else as far as I know. I am also not aware of any separate online index to the contents of the Columbia Flier and Howard County Times. The Washington Post search function retrieves articles back to 2005. Its advanced search option allows sorting results by date (in descending order only). The official Washington Post archive site provides two options, searching articles from 1877 to 1995, or from 1987 to the present; both options have an “advanced search” function that allows searching a date range and sorting results by date. The site provides article previews at no charge; prices for the full articles range from $4 per article to just over $1 depending on how many you purchase. Columbia Association records of Board of Directors meetings, including minutes, agendas, and board packets (i.e., material provided to the board in advance of meetings). At present only records back to January 2014 are available online. Earlier records have been removed from the main CA site and links to them no longer work. “The Making of the Trust” contains links to several documents of interest for the period leading up to the formation of the Inner Arbor Trust. “Corporate Documents” contains links to several documents of interest for the period after the formation of the Inner Arbor Trust. “A history of the Downtown Columbia Project” (formerly “A history of the Columbia Town Center project”) contains a timeline of activities related to GGP and Howard Hughes planning for downtown Columbia from May 2005 to December 2010. Columbia and Howard County blogs. The following blogs include material from people active in the controversies around development of downtown Columbia and/or Symphony Woods. Coale, Tom. HoCo Rising. 2006-present, www.hocorising.com. Tom Coale is a former CA board member. Coren, Evan, and others. Howard County Blog. 2006-2009, howardcountyblog.blogspot.com. Evan Coren is a former CA board member. Dunn, Brian. Columbia 2.0. 2008-present, columbia2.wordpress.com. Brian Dunn is a former CA board member. This blog also served as the website for the advocacy group Columbia 2.0. Hecker, Frank. Civility and Truth. 2004-present, civilityandtruth.com. Frank Hecker is the author of this series. Lane, Dennis. Tales of Two Cities. 2006-2013, writing-the-wrongs.blogspot.com. Dennis Lane was a commercial real estate developer and prominent local blogger. McCready, Julia. Village Green/Town2. 2011-present, villagegreentownsquared.blogspot.com. Julia McCready is a former member of the Oakland Mills Village board. Santos, Bill. Columbia Compass. 2006-2012, columbiacompass.blogspot.com, and 2012-2014, columbiacompass.weebly.com/blog. Bill Santos is a former member of the Howard County Planning Board. Woodcock, Bill. The 53. 2008-present, 53beersontap.typepad.com/53beers. Bill Woodcock is a former member of the Oakland Mills Village board. Web sites of Columbia and Howard County advocacy groups. Most of these are out of date and many are no longer available on the web, except for fragmentary snapshots preserved by the Internet Archive. Note that I have included only organizations significantly involved in advocacy activities relating to Symphony Woods, Merriweather Post Pavilion, or downtown Columbia development in general. Alliance for a Better Columbia. abettercolumbia.org (archived 18 Dec. 2014). Founded by Paul Amico and Alex Hekimian in October 1987. Bring Back the Vision. bringbackthevision.org (archived 6 Aug. 2008). Founded by Emily Lincoln in 2007. Coalition for Columbia’s Downtown. www.coalitionforcolumbiasdowntown.org/AboutUs.html. Founded by Alan Klein in October 2006. Columbia 2.0. columbia2.wordpress.com. Founded by David Yungmann, Katie Dunn, and Mac Cassity in July 2008. Columbia Tomorrow. columbiatomorrow.org (archived 10 Dec. 2012). Founded by Jud Malone in September 2008. Howard County Citizens Association. howardcountyhcca.org. Founded in 1961. New City Alliance. www.facebook.com/NewCityAlliance. Founded by David Yungmann in October 2009. The group also maintained a web site newcityalliance.org before moving to Facebook. Save Merriweather. savemerriweather.org. Founded by Justin Carlson and Ian Kennedy in June 2003. I discuss how the Chrysalis and Merriweather Park at Symphony Woods can attract visitors, based on research conducted by Integrated Insight. I present more details on the Chrysalis foundation/basement or “subfloor” and related construction, featuring the work of Whiting-Turner.